November 28, 2010 – We are downstairs sitting by the pool. It is a sunny, beautiful day. Temperature is heading for its usual 28 degrees. Just another spectacular Vallarta day. Today is a special day. Nobody is working on the house. We have it to ourselves. The only sound we hear is the pool fountain and Aretha Franklin. It is divine. We love the men working on the house, they are great guys but we have two weeks left before they will be done. It is nice to be alone. However, it is also Grey Cup Sunday. The one day of the year that most Canadians gather around tv’s with their friends to watch the biggest Canadian Football game of the year. When I was growing up it was known as the Grand National Drunk. It may not get called that anymore, but it certainly still is. It will especially be that in our hometown, Edmonton as it is being held there in -7 degree temperatures. They have been partying for 3 days. It looks like it should be a great game. A pity that my Eskimos will not be there but being westerners we still cheer for the western team, the Saskatchewan Roughriders. Walk into virtually any bar in Canada and you will find someone wearing their green and white jersey. Once a Rider fan, always a Rider fan. The people from Saskatchewan may relocate across the great land but the green jerseys follow them everywhere. Even to Puerto Vallarta. Today we will become part of the Rider Nation (man that hurts). We are venturing into town to Casa Blakes Sports Bar. It will be full of Rider fans and we will be sitting with 2 of them. Dale & Annette. They live in Victoria, BC but Dale was a transplanted Newfie in Regina. Who else would he cheer for? We met them last year at the same bar for the same game between the same teams. The bar is busy and you need reservations for Grey Cup. Sue Blake puts people together to fill all the tables. She put us with Dale & Annette. It was a riot. Today we will be immigrants in the Rider Nation. It is a daunting experience. We felt their pain last year when they could not count to 13. We will feel their pain this year should they not come out victorious but at the end, we will still be immigrants in a scary land. Riderville. Much like we were two years ago crossing the border into this great misunderstood land of Mexico…. November 14, 2008 – 6:48 am. We were up and ready to go because the walls in the hotel were thin. People had been moving about since 4:00 am. So in our bleary eyed state we started the car and pointed it in the direction of the border. D-Day was here. Were we going to actually do it? We were excited but we were also scared spit less. 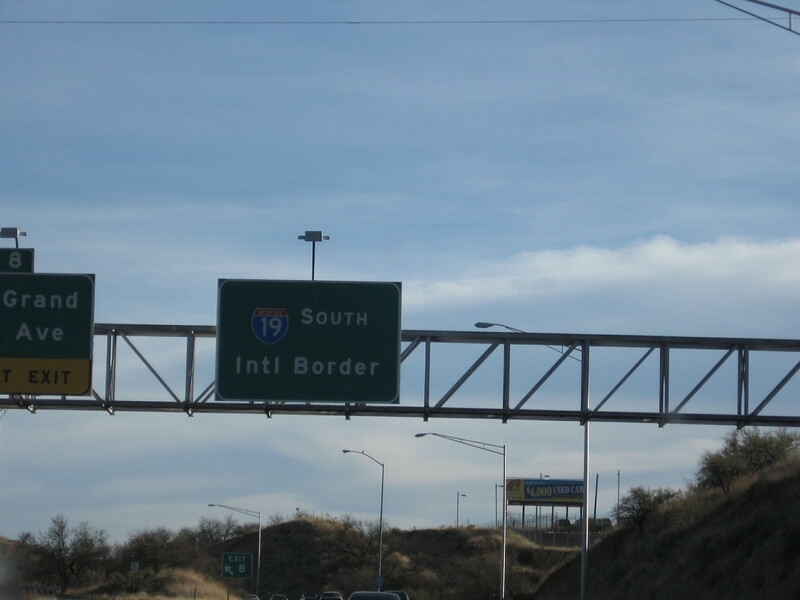 We had never crossed the border in a vehicle before, we had always arrived by plane. Would we get through without an inspection from a corrupt border guard who was looking for money. We did not know whether the stories were true about the customs agents in Mexico but we had everything we owned in that car and did not want to lose it. 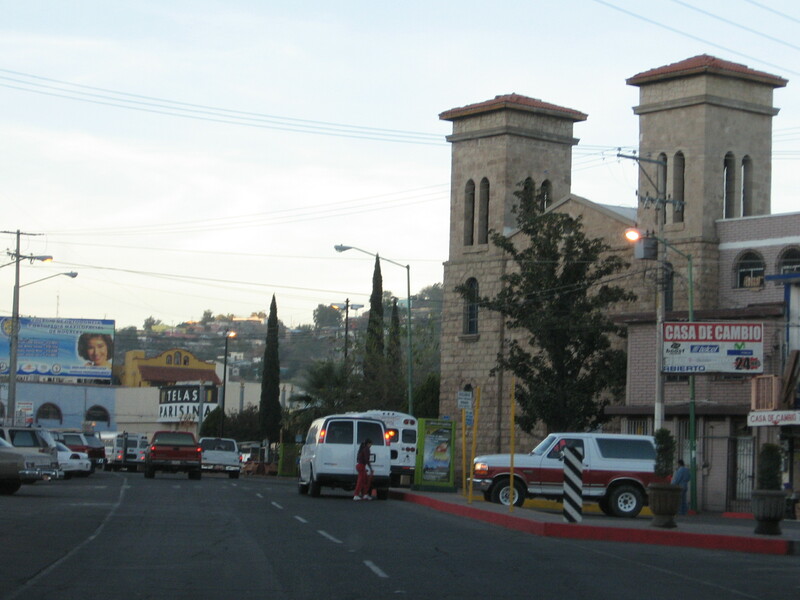 We drove past the American checkpoint and crossed into Nogales, Sonora, Mexico. There were no barricades. You just drove through. Hmm, that was odd. We saw the immigration building and pulled in beside it. We had arranged our immigration papers with the Mexican Consulate in Calgary and they had advised us that this white and red piece of paper had to be turned in at the border. It was 7:00 am. We walked in and located the one person who was working and handed her our documentation. She looked at it and took it back to her desk. She drank some coffee and slowly moved to the copier. Photocopied the FM-3’s (our immigration documents) and our passports (the first time out of about 400 that they were going to be photocopied in the next two years). She took the pieces of paper, stamped the documents and sent us on our way. Was it that easy? Wow. Didn’t expect that. However we still had to go through the customs checkpoint 12 miles down the road. We still had that to look forward to. We drove on right into the center of town. It really is like driving into a foreign land. It was so different. Vendors in the middle of the road selling newspapers, food stands everywhere and lots of different things to catch your attention. We found our way out-of-town still feeling like frightened rabbits. There was nobody else on the road and we started to relax a bit. The signs were all in Spanish but the gps had our backs. It knew where we needed to go and lead us on towards the car importation station. To bring a vehicle into Mexico it has to be imported. You need a sticker. To get that sticker you have to provide copies of your registration, your insurance, your passports (one more time) and a credit card guarantee that you will not leave the car in the country. They charge you $30.00 US for this sticker. We arrived at this station just before it opened are were not the first people there. We were however the only people in shorts. Did I say how freaking cold it was! It was 7 degrees, not what we expected. We waited in line and after an hour we finally got everything taken care of. They gave us our sticker and some paper documents that we were to not to lose and return when the car left the country. There was also some paper work that would be taken at a checkpoint farther down the road. We left the station and there it was. Customs. Here we go. For those of you who have never travelled to Mexico, they have a random inspection system that does not involve questions. After you say whether or not you have something to declare you push a button. Red they search your car and your bags possibly keeping whatever they find, green you drive happily down the road. It was time, I pushed the button and GREEN LIGHT!!!! The gate goes up and needless to say we were out of there as fast as we could go without attracting suspicion. Not that we had anything illicit or illegal but we wanted the hell out of there while we still had all of our stuff. The GPS said we had 24 hours to Puerto Vallarta so we knew we had 3 days of driving ahead of us. It was 8:30. 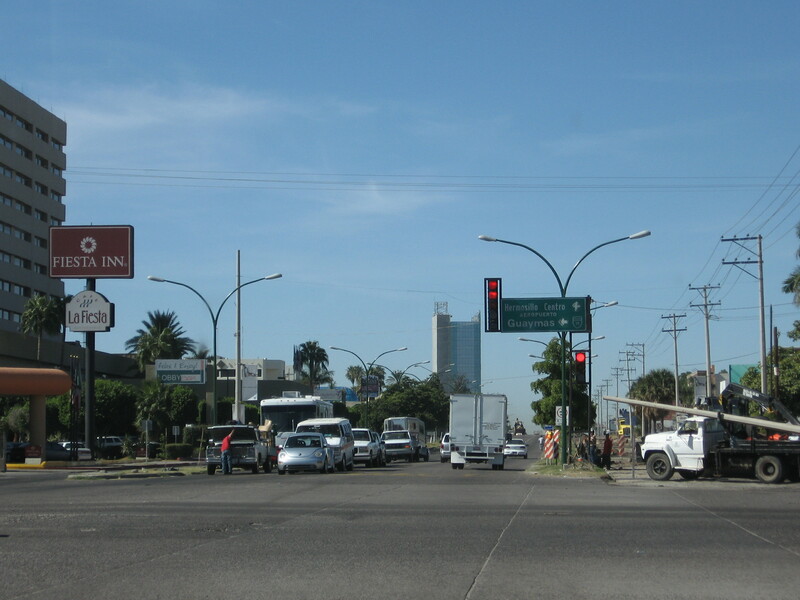 Our destination for the day was Ciudad Obregon. Did not know anything about it but knew it was approximately as far as we wanted to travel that day. We spent some time getting used to Mexican traffic and drivers not that there were a ton on the road, most were Americans and Canadians heading down for the winter. We tried to decipher road signs. That was entertaining as what little spanish we knew did not include translating the verb usage on road signs. Needless to say we just played it by ear but most of the time we had no idea what they meant. 9:30 – We needed a driver change and needed a bathroom. Stopped at Pemex station which had a corner store attached to it and bought some water and some galletas (cookies) that we had no idea what they were about but the girl behind the counter told us they were good. She was not wrong, they were delightful. Nice soft cookies filled with cajeta (goats milk caramel) that were really tasty and to this day if we see them on the street we buy them. A half an hour later we approached a military checkpoint. Lots of men and lots of guns. A little unnerving. They wanted to see the vehicle paperwork. We handed the soldier the form we got from the import people and he took a portion and waved us on our way. Pheeww. You just didn’t know what to expect. We drove on to Hermosillo. A big city. We were in one lane and the GPS was telling us to turn left. 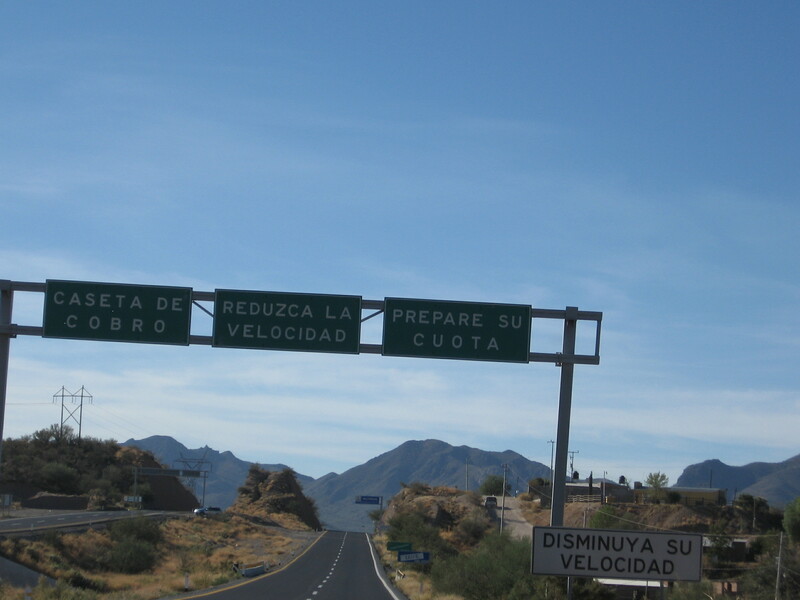 However, I had forgotten one thing about the roads in Mexico. In a lot of Mexican cities they have a lateral road that is to access the businesses on the side. It is generally also used for left turns. We were a little stressed over this and could not turn left there so we went straight. That actually worked out for the best because we were hungry and there, lo and behold, was a Subway! A quick lunch and back on the road. 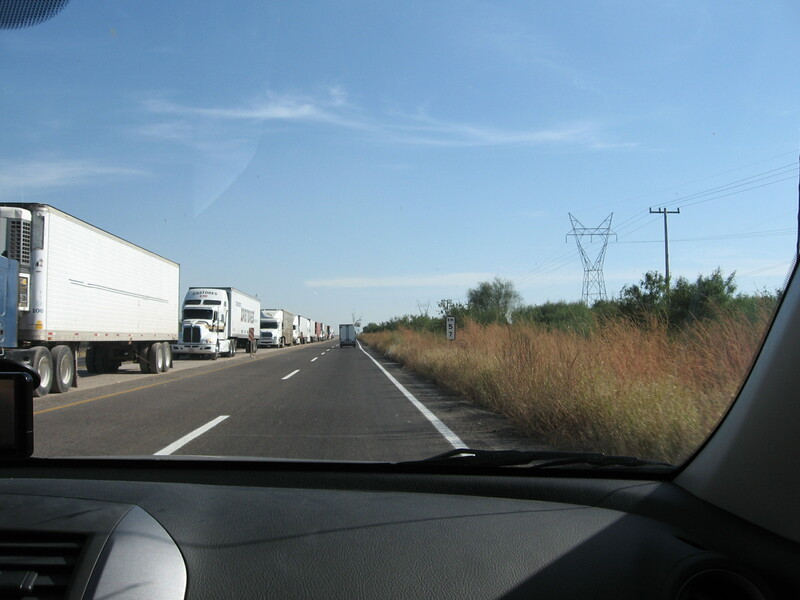 It was a nice drive to Ciudad Obregon. The scenery was nice, we were more relaxed and beginning to enjoy our adventure. We got into town about 3:00 and looked a hotel. We found Hotel Valle Grand. It was $87.00 for the night. The parking lot was secure with a guard. We felt safe. We unpacked the car and went out for a walk to look around. It was hot and sunny. We found a little sidewalk cafe ordered a couple of Corona’s and some chips and salsa and enjoyed the afternoon. We sauntered back to the hotel and relaxed for the evening to ready ourselves for the big drive to Mazatlan in the morning. We slept well that night. We were comfortable, we were in a safe place, we were happy and we knew that things were going to turn out just fine. 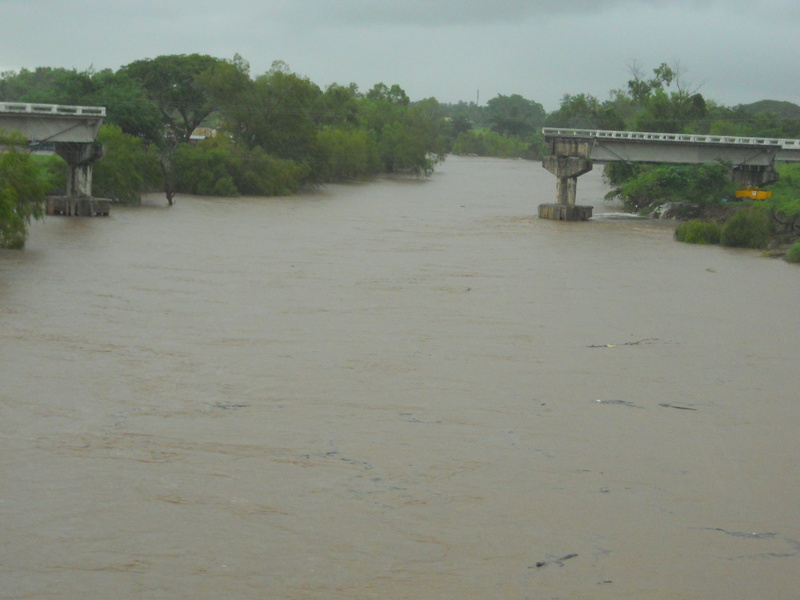 November 23, 2010 – I was sitting in the traffic line up waiting to cross the last remaining bridge over Rio Ameca with 300 of my closest friends to come home after buying a fridge and stove for one of our rooms. Now there is not much you can do when you are sitting in traffic but sit there and think. I was thinking about how nice it is that the government is running the reconstruction of the washed out side 24 hours a day. Because of those efforts the bridge should be open early in new year instead of April which was the original estimate. This wash out has made a quick 15 minute jaunt to Home Depot a 2 hour ordeal. We only go when we absolutely have to. 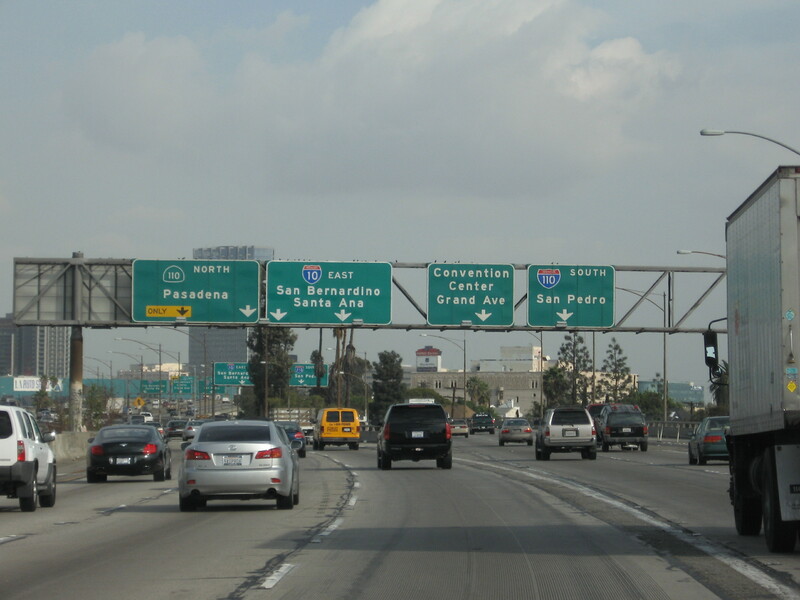 It reminded me of the daunting task of leaving Anaheim, California on our way to Tucson, Arizona at rush hour…. 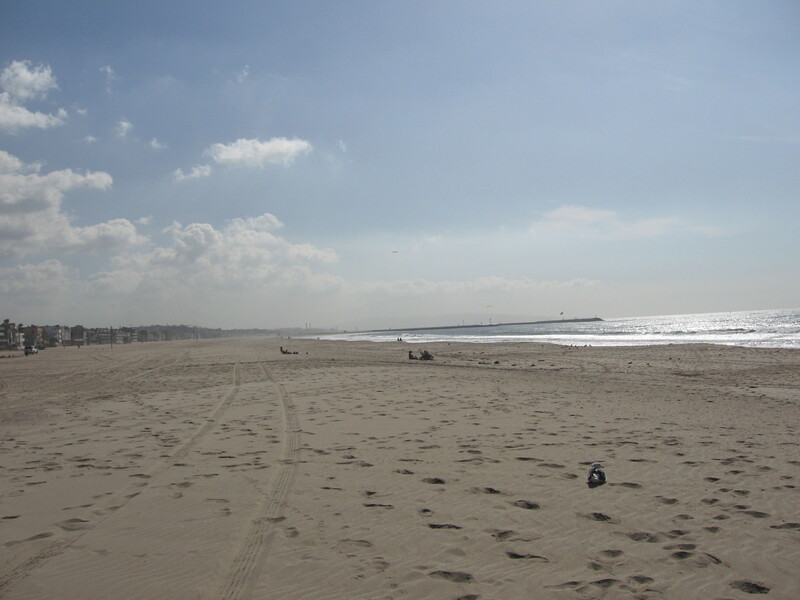 November 12, 2008 – Our original plan when leaving Anaheim was to spend the day and night in San Diego. We wanted to see the San Diego Zoo. I had seen it before but it is always nice to go to a world-class facility. Unfortunately we had been on the road for over 2 weeks and were getting tired of hotels, shuttling in all our of possessions into the room every night, and substandard food. That day we decided the heck with it we will skip the zoo and head for Tucson. 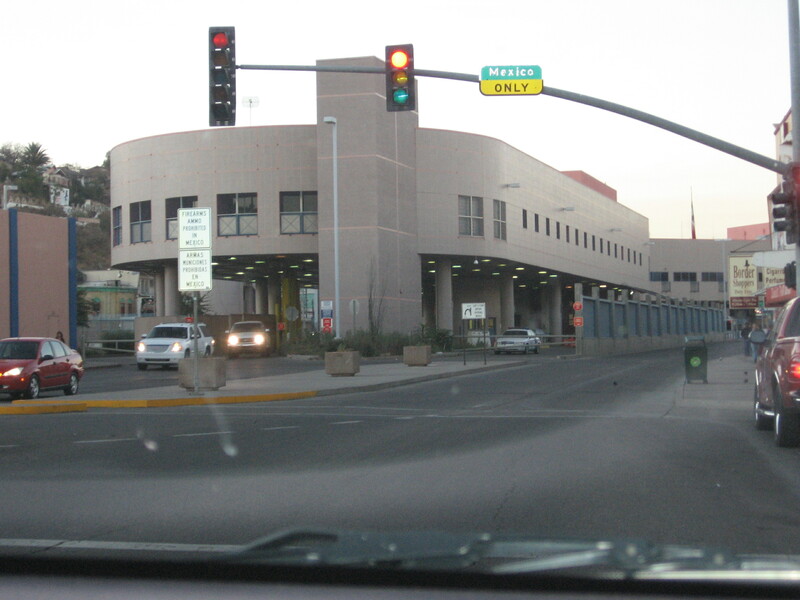 We had long ago decided that we would cross the US Mexico border at Nogales, Arizona as it provided better access to the toll highways in Mexico. 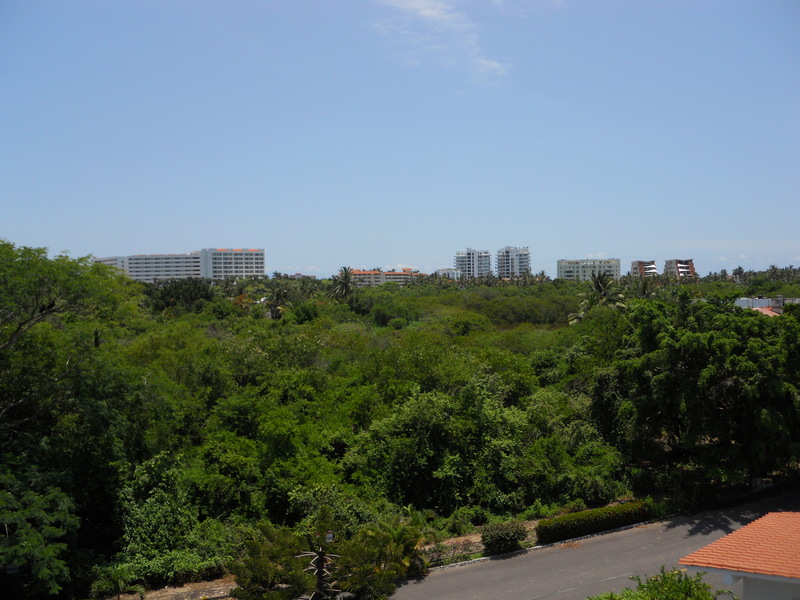 The toll highways would be faster, safer and it was a more direct route to Puerto Vallarta. We set out from Anaheim after the worst free hotel hot breakfast that was served to us on the trip. While it is nice that they do that, this hotel should have stuck with bagels and cream cheese! We had done some internet research the night before looking for a place that would sell a gps map for Mexico somewhere on our route and there was a store that listed Garmin maps in its advertisement in San Diego. The best part was that it was just off the highway so that was our first destination for the day. 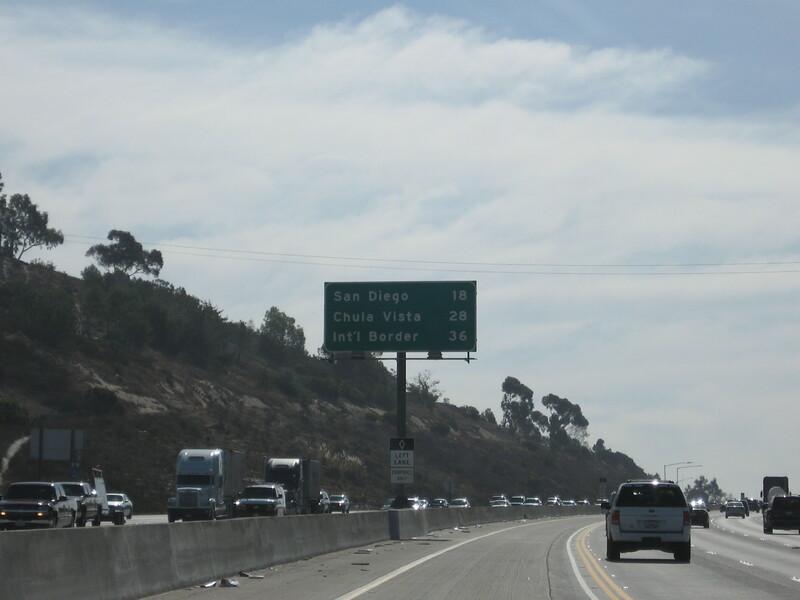 The traffic on the freeway to San Diego was absolutely brutal. All 5 lanes were full and traffic was moving at least 15 MPH over the posted speed limit of 75. While that’s fine in some situations, when its bumper to bumper it is a little hard on the nerves. We made it to San Diego without incident and the steering wheel recovered from the nail marks in time. It was time to find the Map store. A turn here, a turn there, another turn here. Well it should be here somewhere??? Finally located the address. Out of business. Damn. However, we are not really surprised as the location sucked. Oh well maybe in Yuma or Tucson. Off we went on Interstate 8. While we wanted to go to Tucson it was 410 miles and it was already noon. We were realizing that we may have to stop somewhere else. We would play it by ear which is the way we like to travel anyhow because it gives us the opportunity to stop and see things that might be worthwhile. 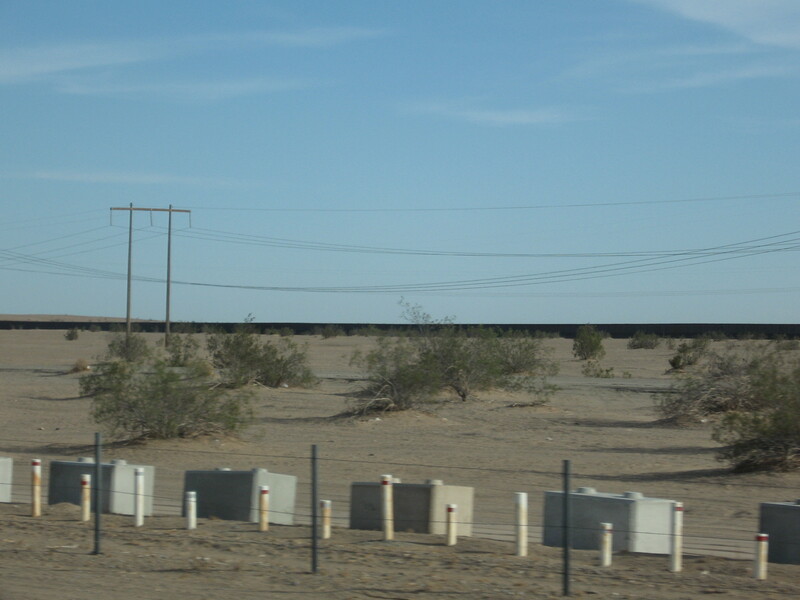 We were about to cross the Mojave Desert so we were not sure if we would see anything or not but we would make time for it if there was. 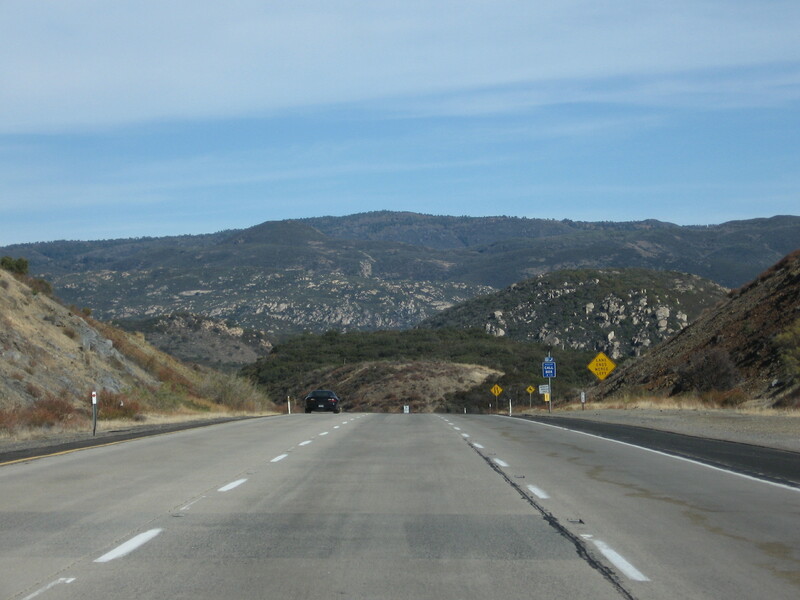 The drive was nice, especially after the hectic drive from Anaheim to San Diego. Traffic was light and the highway was great. It was a good thing as this was a spectacular drive. 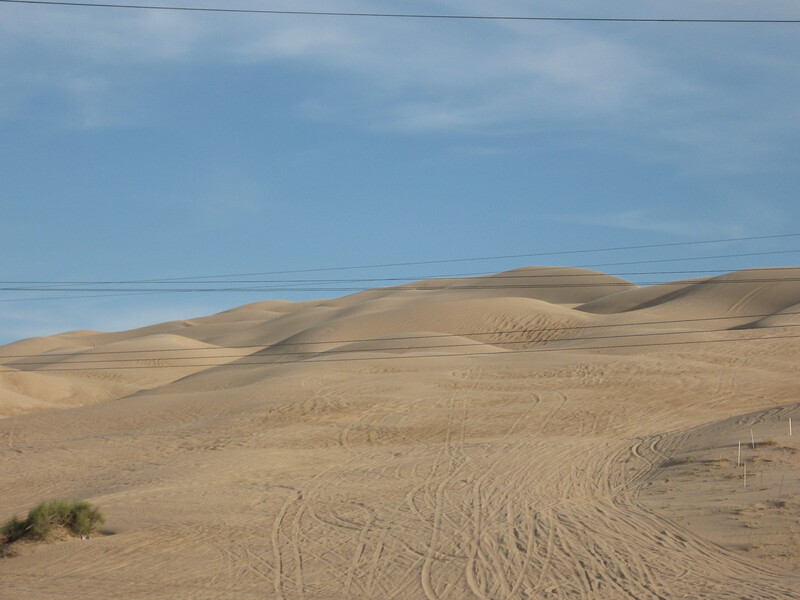 Who would have ever thought that there would be so much scenery to enjoy crossing a desert. 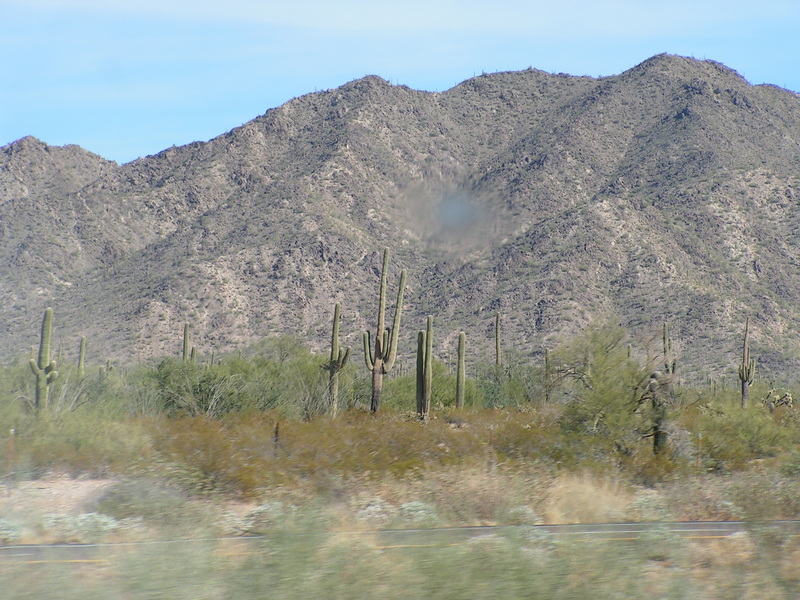 This is a high elevation desert so there were lots of mountains, big rock faces and Serrano Cacti by the thousands. They were unbelievable. We arrived at Yuma at 4:00 pm as the time zone had changed and decided that we would stay there the night. After touring a few hotels and deciding that Yuma and Santa Barbara should start a most expensive lodging club we finally found one that was ok and close to our budget. This took almost an hour and a half. 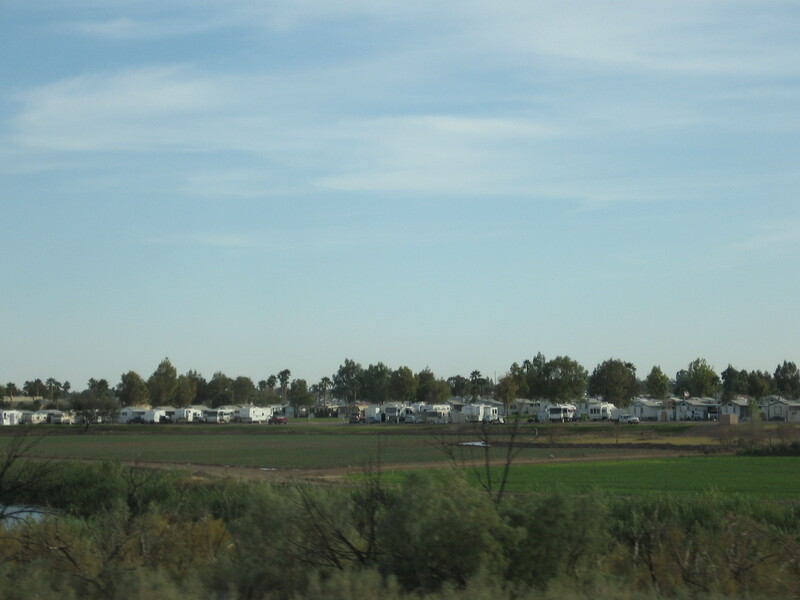 Yuma is a very oddly laid out town and it was difficult finding the hotel zones. We unloaded the car and went outside to enjoy an absolutely beautiful desert sunset. The one thing about touring looking for a hotel was we also saw a great many restaurants. We decided on BBQ. It was good but not exceptionally good. We realized that this was a chain so it was cookie cutter formula food. We have since been to Texas and found out what proper BBQ should be, but that is a story for another day. We spent the evening planning our route in Mexico using the paper map we bought earlier in Windsor, California. It was important that we planned it out as we had no intentions of driving at night and wanted to make sure that we knew which towns or cities we had to stop in. 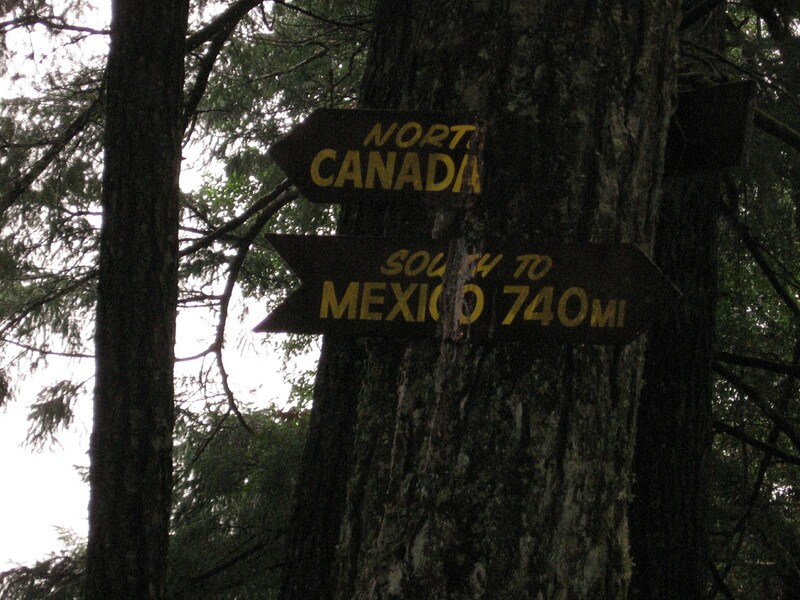 We knew that when we crossed the border that we would take 3 days to do the remaining miles. We were up in the morning and off to Tucson as we had located a store there that did sell the Garmin map for Mexico and they had it in stock. 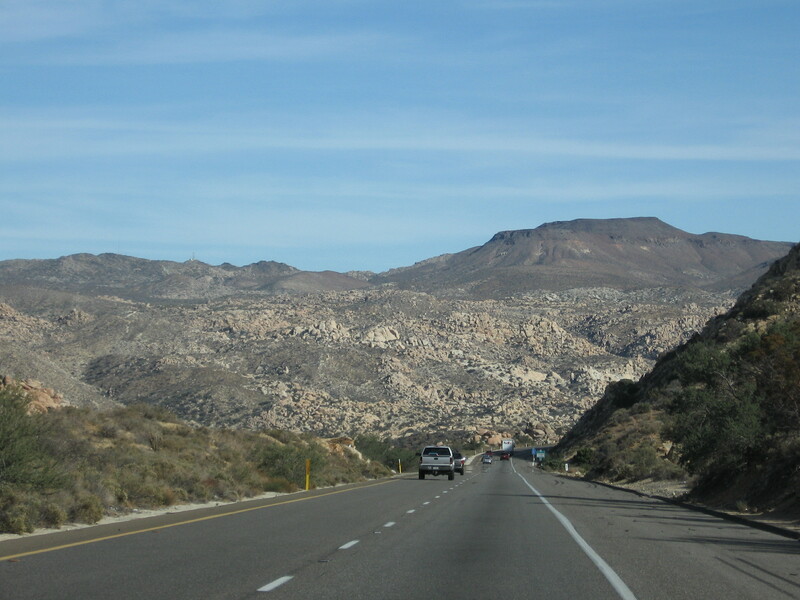 241 miles of desert, mountains, more desert and Serrano Cactus. 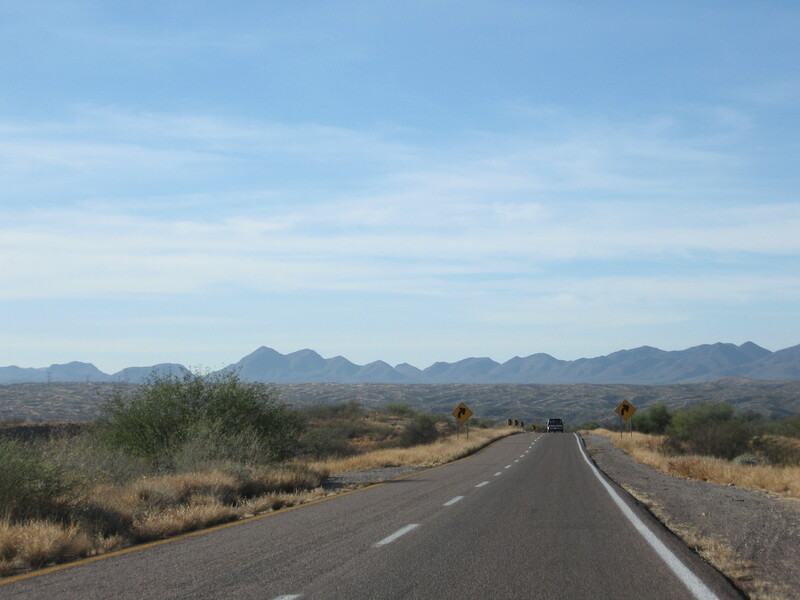 We found the store, bought our map, grabbed some lunch and headed for Nogales, Arizona. The border town. We thought it would be better to stay the night on the American side then try to find a hotel on the Mexican side. That way we could get up early and hit the border before it got busy. It was an hour to Nogales. Driving into town was different. This was a border town, no doubt about it. Very rough-looking. They had three hotels. A Super 8 built in probably 1960, a Best Western that did not look like it was in the best area of town and a Holiday Inn that had just opened. We tried the Holiday Inn. No go, fully booked. Super 8 it was. It was early in the mid afternoon so it gave us some time to do some laundry. Heather was doing that while I was downstairs checking email in the lobby. I was on my way up the stairs when I heard this blood curdling scream (one that I was going to get very familiar with over the next few months) coming from our room. I dashed up stairs trying not to drop my computer and there sitting on top of our freshly washed clothes was the biggest freaking bug I had ever seen. Really this thing could have carried away small children. We brought it to the attention of the desk clerk who calmly came up and killed it. We know it came out of the dryer and was not in the room because the hotel was spotless. It was at that point we went to Safeway and bought a bottle of wine as we had the sneaking suspicion neither one of us would sleep all that well tonight. It was during that drive around town that we saw that the town was not really that bad, it is just old. We hit the mall, did a little shopping and asked people for suggestions for dinner. We were directed to a little mexican place downtown. We were not disappointed. The food was delightful, the people were friendly and we left well fed and watered. We retired back to the room both with apprehension as the big event was here. We were about to cross the border. The scary border that we had heard so many bad things about. What will happen? What about all the goods we are carrying and dealing with customs? We just could not turn back now. It had to happen. So we climbed into the bed whose mattress was probably not manufactured in this decade and drifted off with visions of the new adventure starting in about 8 short hours. November 15, 2010 – Tonight I gave Alfonso a ride home as he lent his bicycle to Marco whose bike had broken and lived farther away. We were told last week by our insurance agent that Mexicans are not allowed to be on foot in our neighbourhood after 6:00 pm unless they live in the neighbourhood. Otherwise they run the risk of being picked up by one of the many police patrols that run through the area. I am pretty sure that is not a ride any of them wanted to take so I loaded him into the jeep and ran him over to Jarretaderas which by car is only 5 minutes away. The man loves to talk and he loves to talk about music (no wonder I like him). And he really likes to talk about english music. It was very strange his first day here when he turned his ghetto blaster up to about 9 (so he could hear it over the smashing concrete) and into our home flowed Can’t buy me love by the Beatles. This was followed up with many other Beatles classics. Throughout the day we were treated to Creedence Clearwater Revival, the Eagles, The Bee Gees and finally the one english music radio station in town. CKUA stayed silent in the house that day. 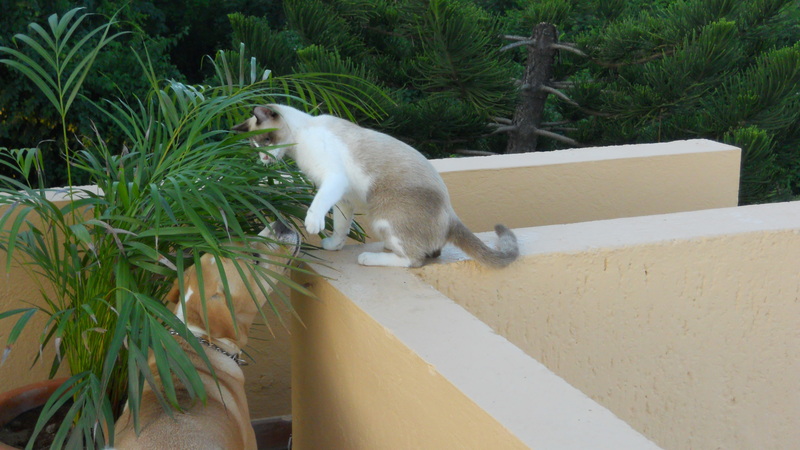 Mainly because there was not a snowball’s chance in Puerto Vallarta that we could hear it! But I digress, all the way to his casa he talked. Trying to find the right english word for this and that. Asking me for the proper word in english for this spanish word. Now this would be just fine and dandy if my spanish vocabulary was more than about 200 words! I fear that he is going pick up the wrong english from someone who had no idea what he was asking me in the first place. It was quite the enjoyable ride. 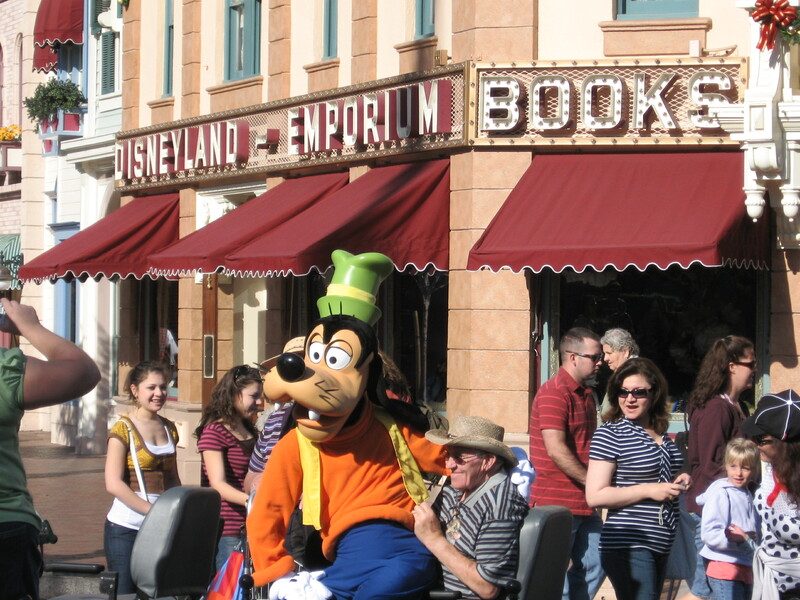 Reminded me of many of the rides we were on in Disneyland…. 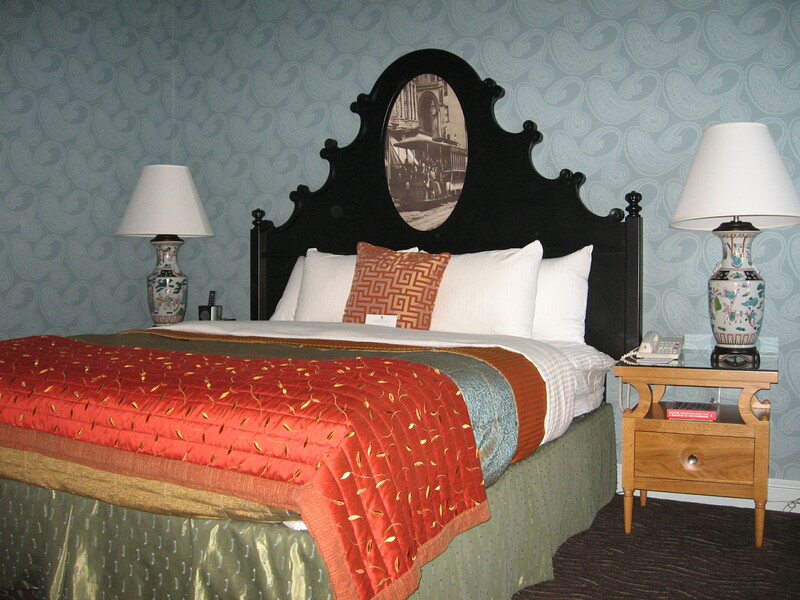 November 10, 2008 – when we checked out of the hotel in Santa Barbara (who knew it was an elitist playground? apparently everybody but Heather and I) after we coughed up the ridiculous amount of money they wanted for a very average hotel room we asked the desk clerk about the Monarch Butterflies. We had been reading that there is a park where the butterflies rested in Santa Barbara on their migration to Michoacan, Mexico for the winter. The desk clerk told we where the park was and said it was very close. He gave us directions and we set out to find it. 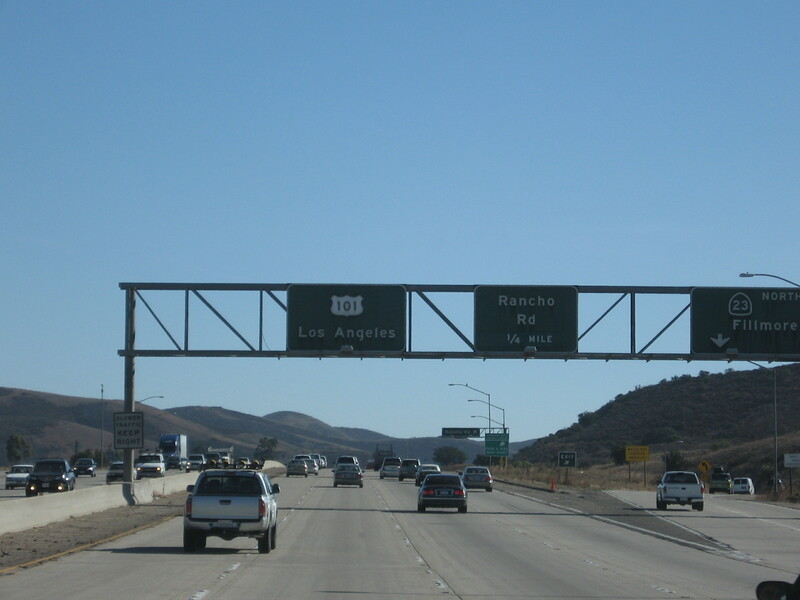 After driving in circles for what seemed like hours but probably was only 45 minutes, we said the heck with it and headed for the freeway to LA. Our plans were to hit a few high spots in Los Angeles on the way through and spend the night in Anaheim so we could hit Disneyland the next day. We figured that we were there so we should make a stop at the Happiest Place on Earth. I would like to actually see this at night! 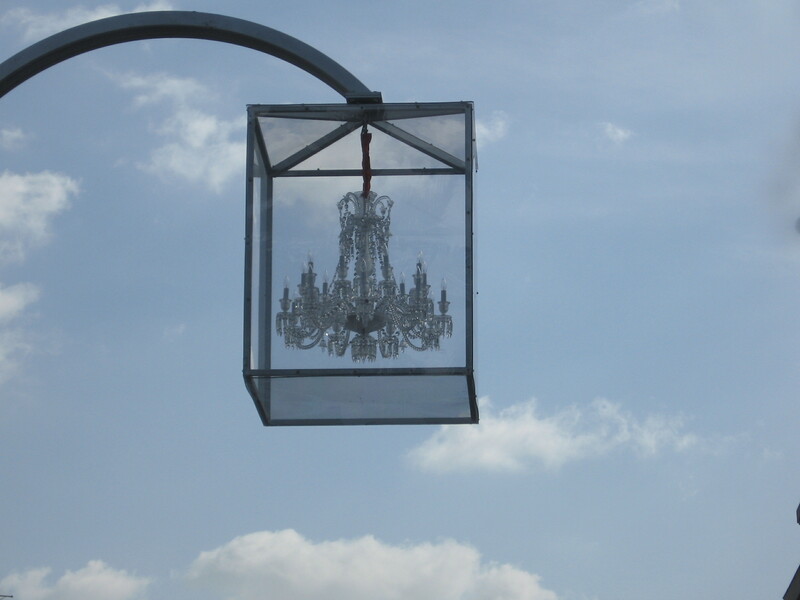 is kind of cool and they have chandeliers for street lamps. 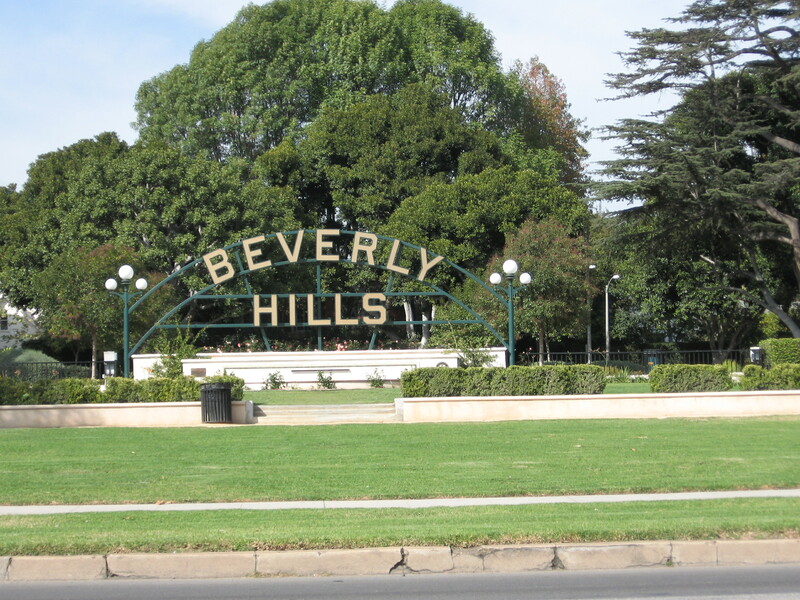 Had no plans to actually shop on Rodeo Drive or shop period as we could barely fit a bag of chips in the car as it was so we just drove the street. On to Hollywood and Hollywood Boulevard. 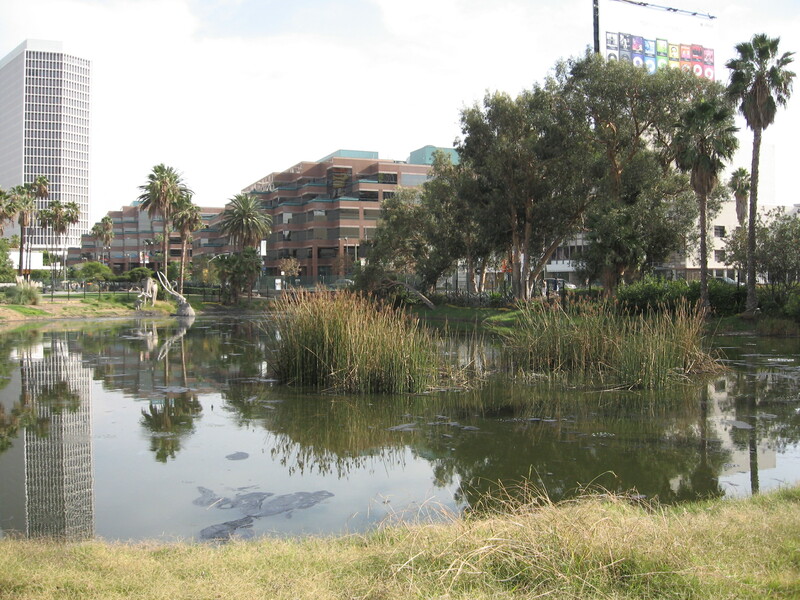 Checked out Grauman’s Chinese Theatre, the walk of fame and moved on to the La Brea Tar Pits. Those were interesting and worth checking out if you are stuck for something to do in LA. 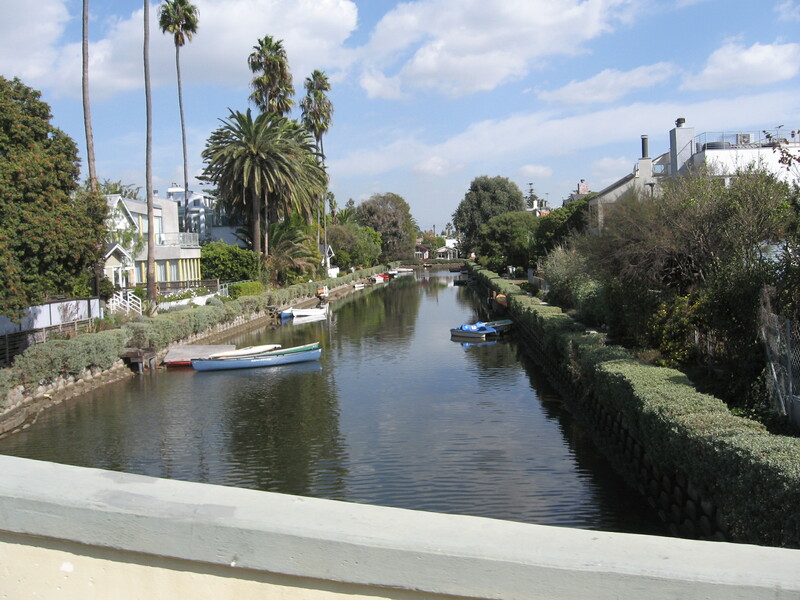 Over the years we have heard so much about Venice Beach so we decided it was a nice day we should check it out. We were 2 of maybe 6 people on the beach. Not much going on but what a beach, goes forever. The water however is not the warmest in November. The day had been full so we thought we should mosey on to Anaheim before the traffic really built up on the freeways. I have driven the freeways before with a map and made out ok but man the GPS makes things so much easier. The little voice tells you a couple of kilometers ahead that you will be exiting right instead of the passenger (does not matter whether it is Heather or me who is the passenger) saying I think that was our exit we just blew by. It was a nice comfortable drive to Anaheim, found a reasonable hotel (100 bucks cheaper than the night before in SB) and relaxed for a bit before heading out and finding some dinner. The next day we awoke to an absolutely perfect Southern California day. 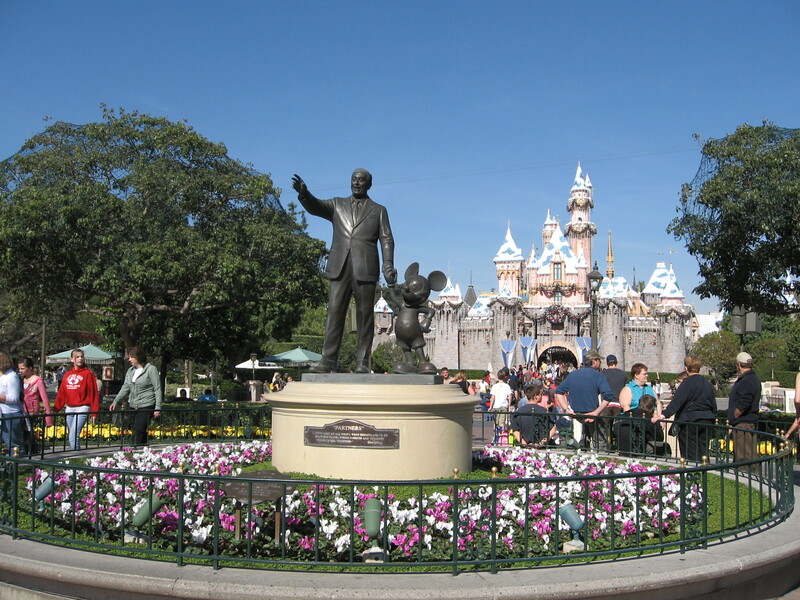 Sun was shining, temperatures were warm but not too hot, all in all a great day to visit Disneyland. We did every possible thing we could do there. Watched the parades, listened to the Barbershop Quartet, watched some of the shows. It was great. We especially enjoyed the evening show, Fantasmic. You had to be in place early but it was worth it! It had been a long day and we had a lot of miles to cover in the morning so we said our goodbyes to Mickey and started the walk to the hotel. It was a beautiful night and enjoyable to be walking without a coat in November. We were hoping we would never need a coat in November again….boy were we wrong! 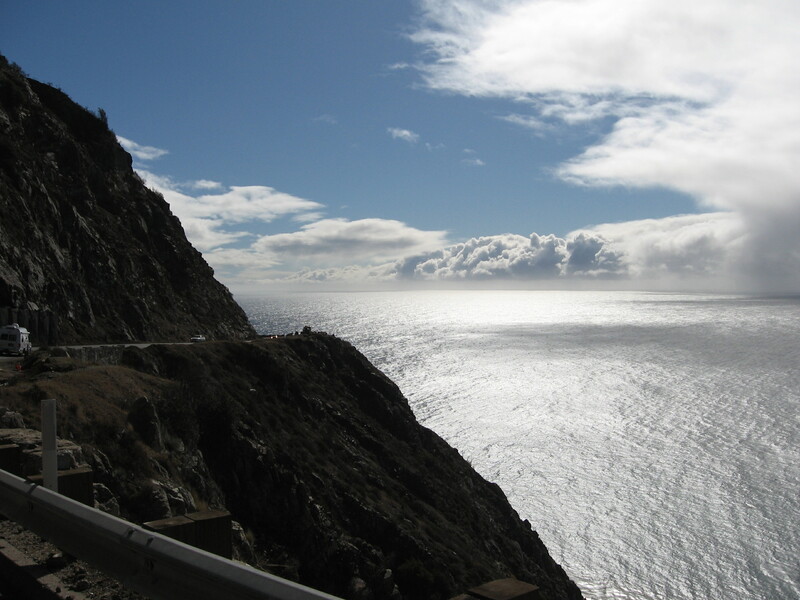 The Journey to Casa Madera – The Pacific Coast Highway! Thursday morning 7:50, November 11, 2010. Heather and I have just come back from walking Alexa and there is Alfonso, Roberto and Marco waiting at the gate to get to work. 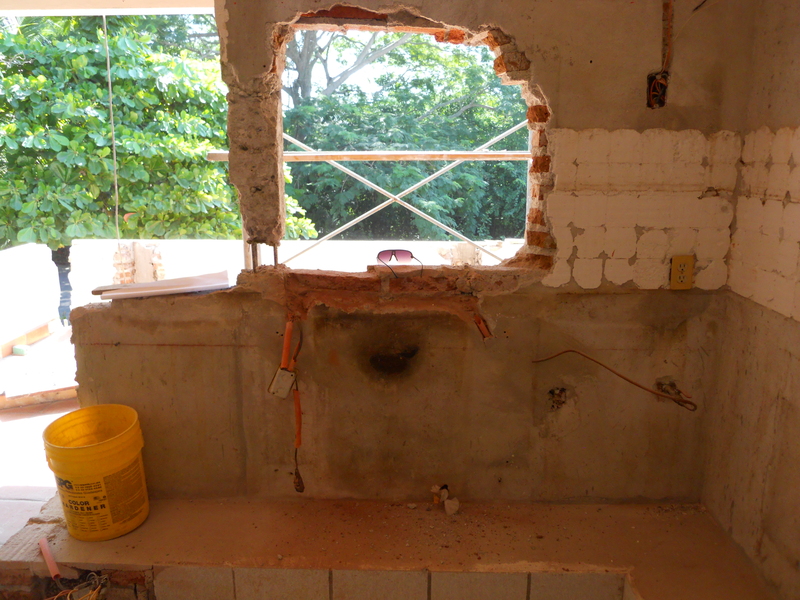 They are into the third week of what we thought was a minor renovation to build a new kitchen and improve the air flow and light in that area of the house. 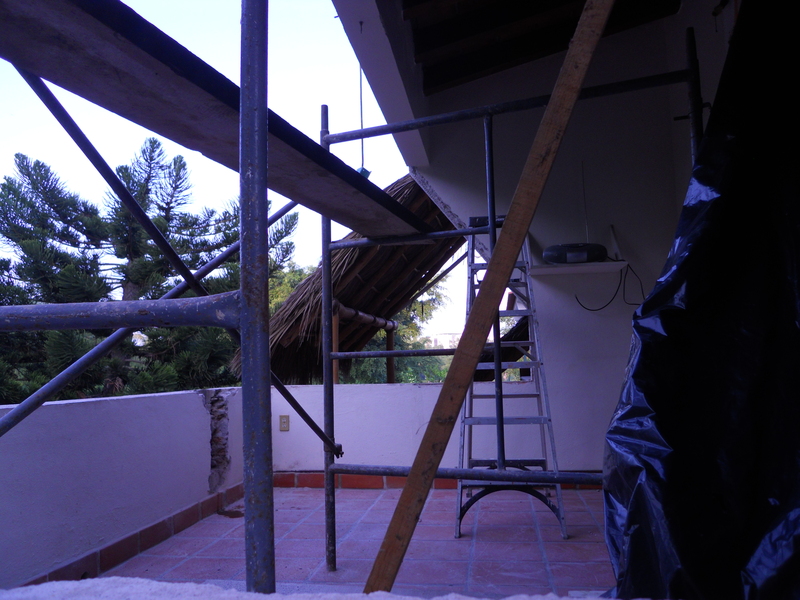 There is still a pile of work to do before they can start to put on the new roof. They are their usual selves, smiling, happy, ready to start their long day. As Alfonso goes through the gate he says, yo tengo desayunos por ustedes. For the readers who don’t understand spanish, he brought us breakfast. We told him we would get Alexa settled away and would meet him in the black hole that would one day be the kitchen. Man it is so much bigger without cabinets! Now as a background, we noted the day before that the boys had brought their own hot plate to heat up their breakfast as they don’t eat before they leave their respective houses. We come into the kitchen after filling our coffee cups and Alfonso tells us that he got the food from people who live by him who own a lunch truck. The truck goes by our place twice a day with food for the people who work in the area. They serve full meals at a reasonable cost. And man is it good but more on that later! First off Alfonso offers us both Cokes. Ice cold right out of his cooler. In glass bottles so you know they are delightful but we just cannot drink Coca Cola at 8:00 in the morning so we stick with coffee. Coca Cola is the national drink in Mexico, most people may think it is Corona but it is not. Its plain and simple, Coke. I am pretty sure it outsells everything else 4 to 1. Even though you can buy Pepsi cheaper everybody in this country drinks Coke, a lot of it. But on to breakfast. He offers us a choice of loaded tacos, one type is arrachera (a personal favourite) and the other is lengua. Affectionately known in english as tongue. Never a real high point in my menu but its a taco and we must be polite so we go for the lengua first. Now I have never liked tongue, tried it a few times but it never did anything for me. This taco was unbelievable. It was absolutely delightful. Everything had been mixed to perfection and everything just melted in your mouth. The flavour was fantastic. It reminded of some grape tomato’s we bought at a farmers market outside of Marina, California as we were heading for the Pacific Coast Highway. 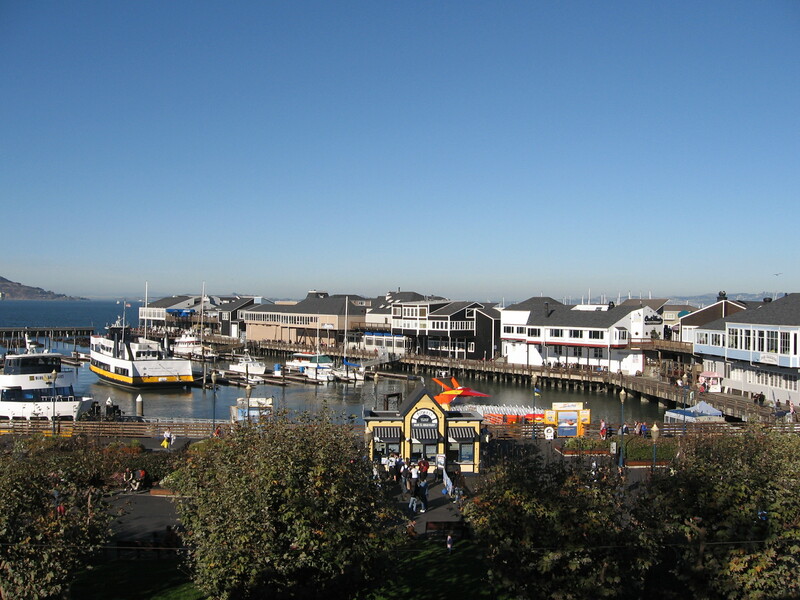 We left our hotel in San Francisco on November 9, 2008 at 8:03 AM dressed in shorts and light shirts as we were looking forward to a hot day in the car. The sun did not disappoint. At 8:00 it was warmer than it had been the entire day before when I seriously considered putting on my Saskatchewan Roughriders sweatshirt. It was a very much appreciated gift from Mr. Cook and his cohorts and has come in very handy here on the cold mornings but I would rather no one who knows me ever sees me in it! We worked our way out of the city into the California farmland. There were farms everywhere. We are used to seeing farms but being Albertan we are used to seeing waves of wheat, rye and canola, not lettuce, tomato’s and other vegetables. We were rolling into Marina, California when we spied a fast food chain where we could grab a coffee and use the bathroom. Off the highway we went and lo and behold weren’t they having a farmers market in the parking lot. Well that had to be checked out and check it out we did. We found some fresh picked grape tomato’s that quite simply were the best tomato’s either one of us have ever tasted. They were sweet and juicy and well we could go on but then I would lose the G rating. The 2 pound clamshell that we paid about 2 bucks for was gone before we got to Monterey. 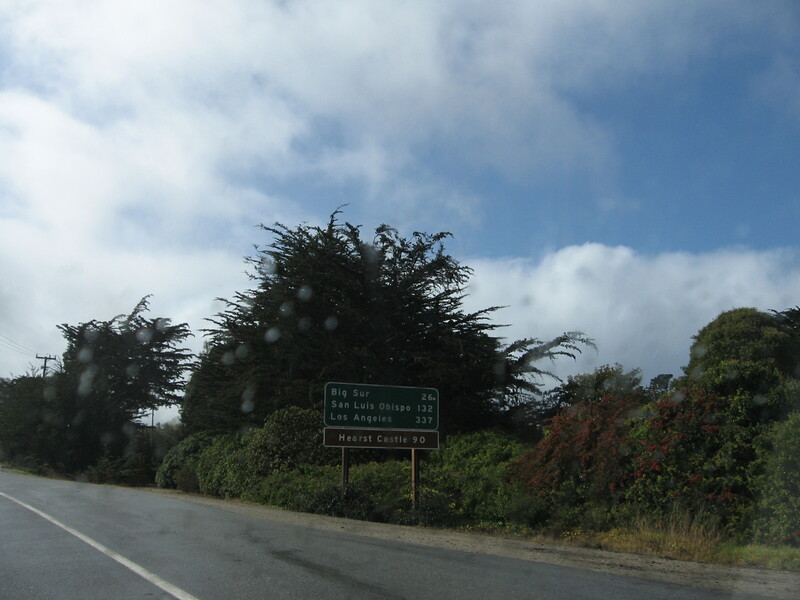 We thought we might stop in Monterey to sightsee but realized that it is a long way to Los Angeles and even longer on the PCH so we kept right on moving. The Pacific Coast Highway is a nice drive. The road is narrow, twisting, hilly and very slow. It was the perfect road to drive to get us ready for what lies ahead in a few more days. Traffic was not bad, the scenery was spectacular and the road was fun to drive. At 1:25 we had been driving for 5 hours and had managed to go 291 kilometers. The average speed after we left Monterey was 35 miles per hour. We had a long, long way to go yet. We stopped at Piedras Blancas which is just north of San Simeon. 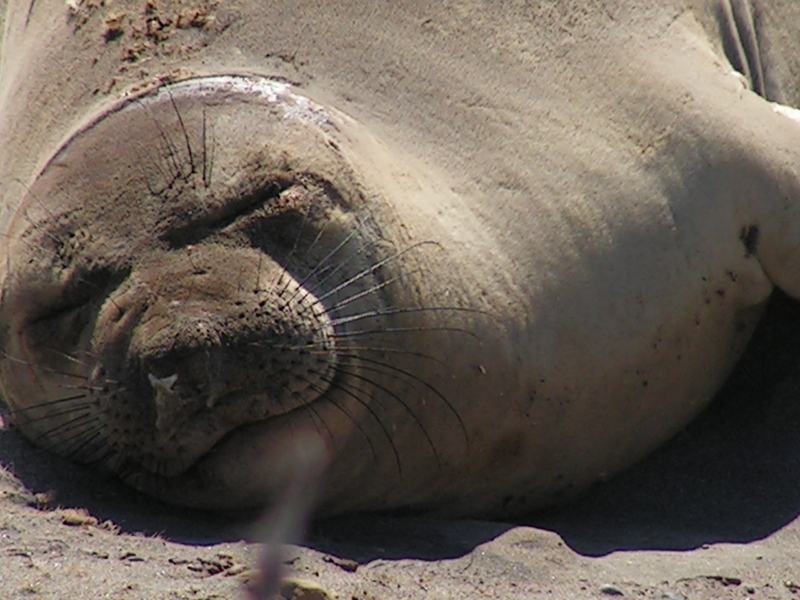 There is an Elephant Seal Rookery there and you can get pretty close to observe them. It was pretty cool. Still driving, lots to see on the road. Looked a lot at the water and vistas, decided to pass on Hearst Castle. Maybe next time. Still 236 miles from LA. We drove and drove and drove and drove. Just when it seemed like we would never see civilization again at about 5:00 pm we rolled into Santa Barbara. We decided at that point it was time to pack it in for the day. We spent the next 45 minutes looking for an acceptable hotel. We finally decided on a Best Western. I parked the car and we went in to see if they had a room. Yes, $170.00. Man I almost swallowed my tongue! We had seen some of the other hotels and they were not that great. 170 bucks, man we only paid a 100 in San Francisco! Oh well they had nice bathrobes. Author Kevin WoodPosted on November 13, 2010 Categories Starting new lifeTags Big Sur, California, California State Route 1, Coca Cola, Los Angeles, Monterey, Monterey California, Pacific Coast Highway, Piedras Blancas, San Francisco, United StatesLeave a comment on The Journey to Casa Madera – The Pacific Coast Highway! 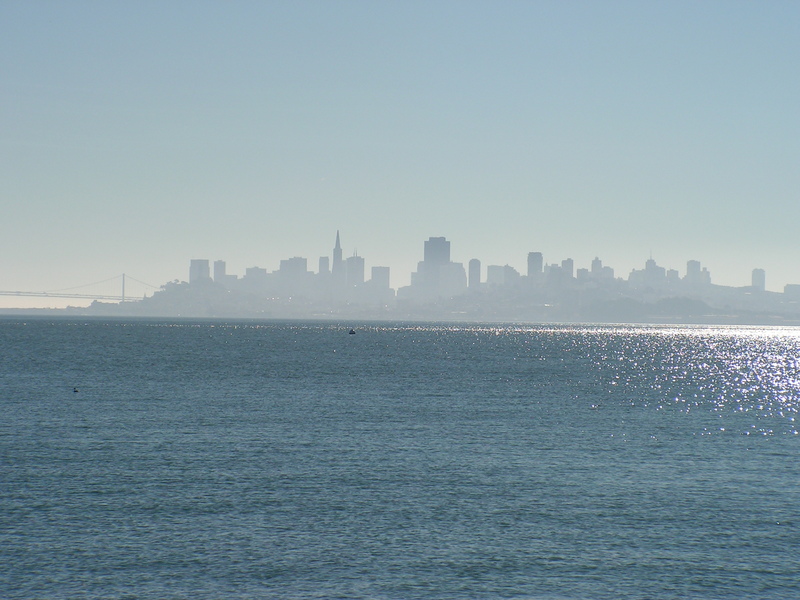 The Journey to Casa Madera – San Francisco! Sunday Morning, November 7, 2010 – 7:58 AM. We were just returning from taking Alexa for her morning walk and I was in cool down mode from my morning run when we spied Alfonso and his white pick up truck backed up on the lawn in front of our gate. As we get closer we see that Alfonso is not alone. He has his 14-year-old son with him and 2 other men. 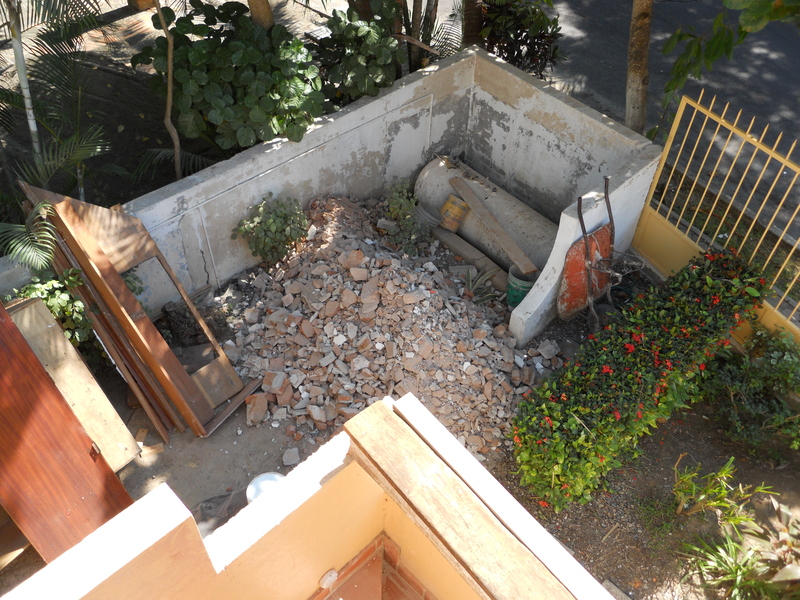 They were here to pick up the concrete and brick that had been piled up during the demolition and to bring wood back for the construction of the roof over our kitchen patio. This is what is left when you know how to use a sledgehammer! It was 7:59 on Sunday Morning! We had not even had coffee yet and they were here ready to work for 5 hours. Don’t ever say anything to me about a lazy Mexican because it is just a media myth like so many other things about this great country. with our coffee as we try to do everyday but Sunday is special. Sundays we generally take off, we relax, we read, we remember why we moved here in the first place. 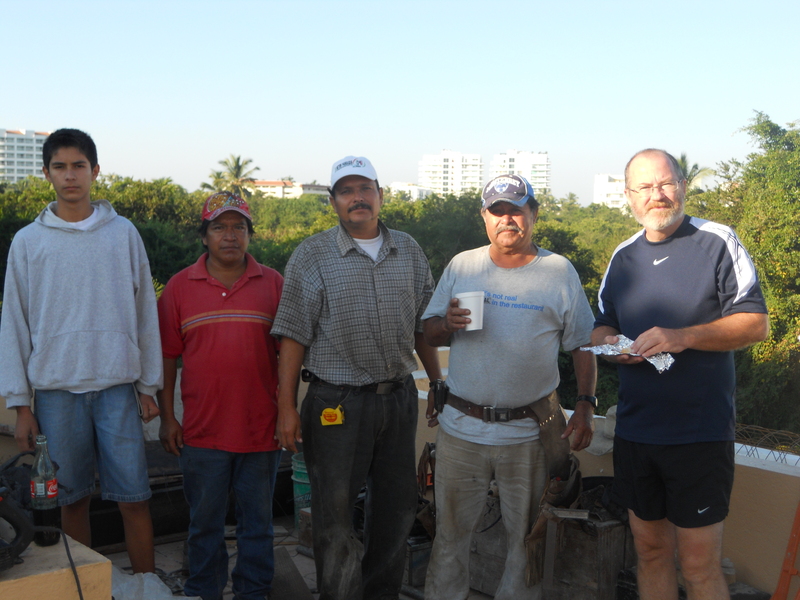 So as we sat on the roof enjoying our coffee the men below loaded the back of the pick up with concrete pieces and bricks. 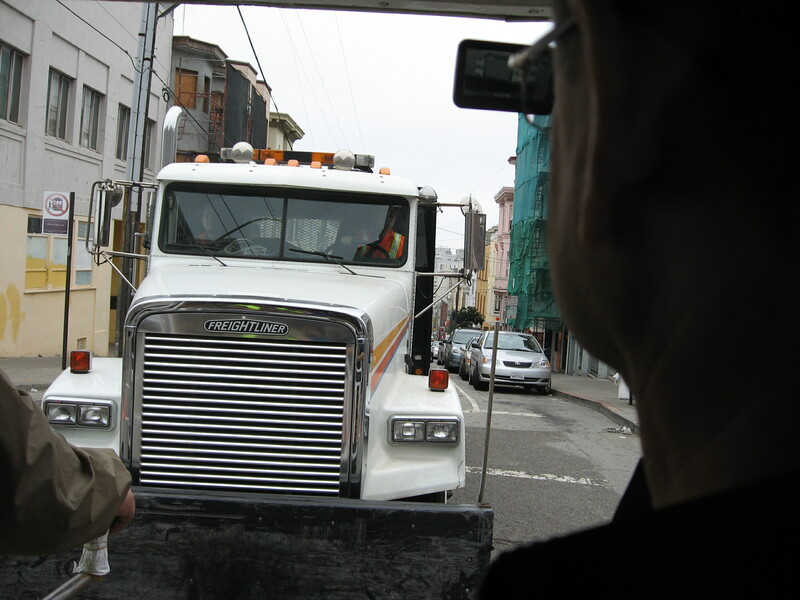 The truck loaded Alfonso yelled up that they would be back and we heard the truck doors close. And then we heard the sound. The sound that a 1977 Ford F-150 makes in Canada when the night before it was -25 celsius and you forgot to plug it in. The starting whine but no catch. A 20 second break and they try again. The whine but no catch. This goes on for a few minutes before I wander down the stairs and to see what is happening. The hood was up. There was space. You forget that 30 years ago there was actually room under the hood of the car. Space under a hood, what a concept, but this is not a blog about what they have done to our cars so on we go. After many tries the truck was not going to start. Hmm, what to do. I ask if they have battery cables. No. It was at that point that Alfonso realized they were out of gas. (there is no working gauge, speedometer, heater or a/c controls or radio in this truck) So we decide to siphon some out of my tank as it was full. No go, who knew that a Jeep had a plate to stop siphoning of your tank. Off to the Pemex we go. Bought 6 litres of gas and return to give it another try. The truck sounded better but still no go. They decided that it was because the truck was not level so it was then necessary to push the truck on to a level spot on the street from its current resting point. So there we were; Alfonso behind the wheel, the two Mexican men, Alfonso’s son, Heather and I all at the back of a fully loaded pick up pushing it into the street. 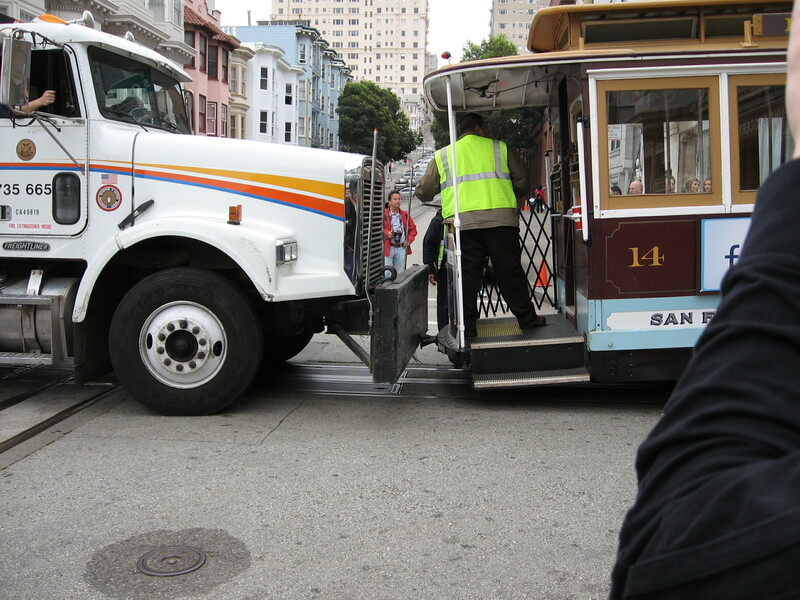 It reminded me of a cable car incident in San Francisco 2 years ago tomorrow…..
November 7, 2008 – Sonoma, California 9:00 AM. Checked out of the Best Western and headed down the highway to San Francisco. One of my favourite cities. Has been from the first time my parents took me to it in 1967. As always, I am looking forward to my return. Don’t know what it is about the Bay Area but if I can find a reason to go there I will. We are driving in a fog, a fog that has nothing to do with the bottle of Eric Ross wine we had with dinner the night before, it was Bay area fog. The type of fog they always talk about in old english novels, thick, very thick. We were in no real hurry as the drive was a short one but we took it easy just the same hoping it would lift soon. The main reason is we knew that in about 30 minutes we should be able to see the bay and the scenery surrounding it. By the time we got to the bay our hopes were answered. The fog was gone, the sun was bright and it was very, very warm. Just prior to crossing the Golden Gate Bridge is Battery Spencer. 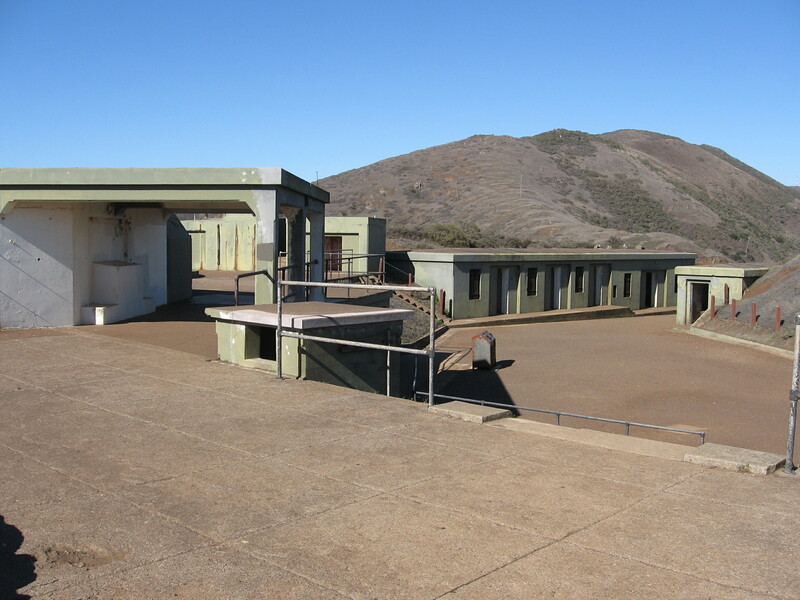 The US Military considered San Francisco Bay to be a major strategic location so they built installations throughout the bay with the Battery being the last as weapon firepower had increased to such a point that previous installations at locations such as Alcatraz were no longer needed. It was in operation until the end of World War ll. 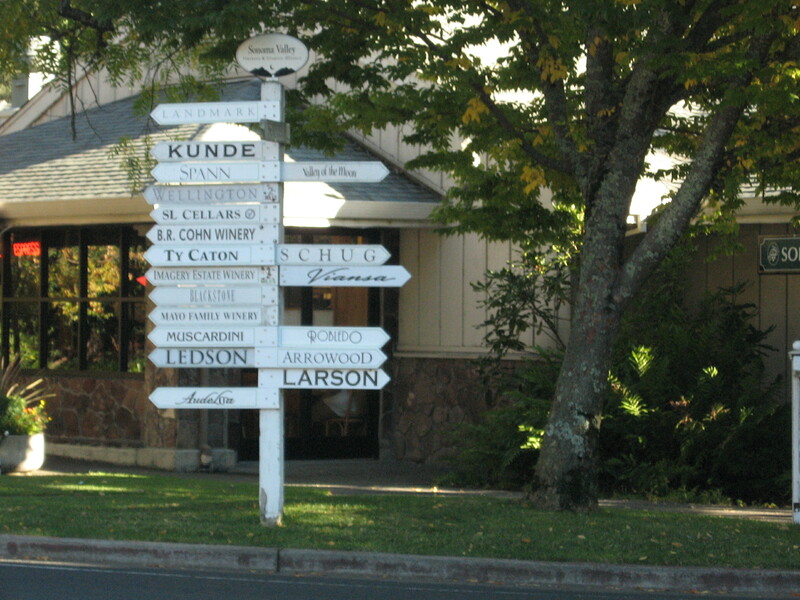 Now you can do a self guided walking tour. 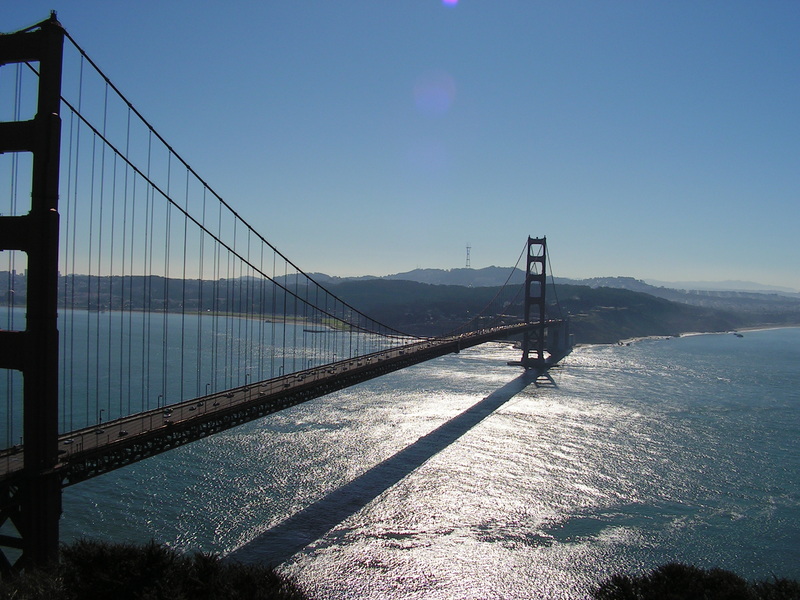 The stop provides a beautiful view of the Golden Gate Bridge. The thing about San Francisco is there are just so many things to see and do one never really knows where to start. We had reservations at the Best Western Carriage Inn downtown but we could not get in there until 3 so what to do to start. 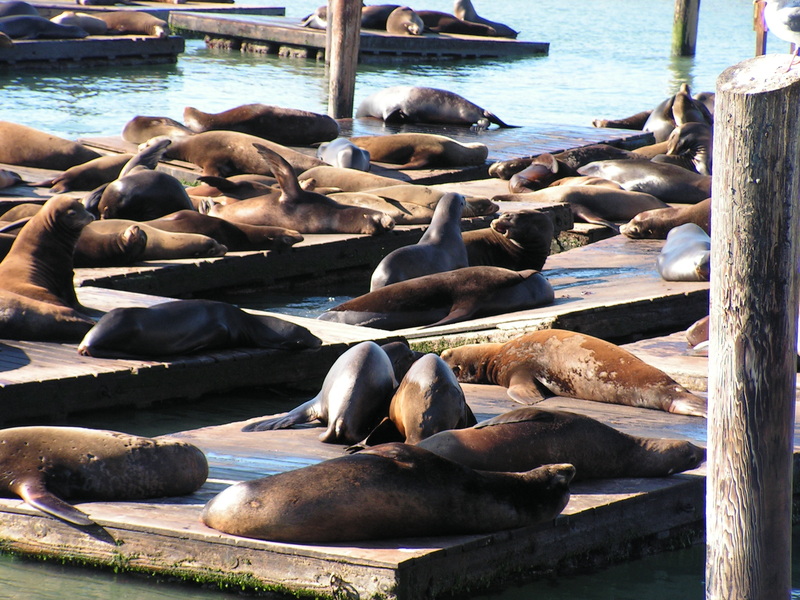 We did what all tourists do, we head to Fisherman’s Wharf and Pier 39. The Wharf was my favourite as a kid. Dungeness Crab Cocktail available everywhere for a buck. Fresh from the sea. For someone from landlocked Edmonton it was totally unbelievable that crab could taste this good. Well it was 2008, Crab Cocktail is no longer a buck but it is still fresh and tasty! And this is a lesson. Watch the Seagulls! We had just got our lunch from one of the many stands that line the wharf and were crossing the small street to eat in the park. As soon as Heather stepped out from under the canopy she was dive bombed by a seagull who almost knocked her down and got her food. 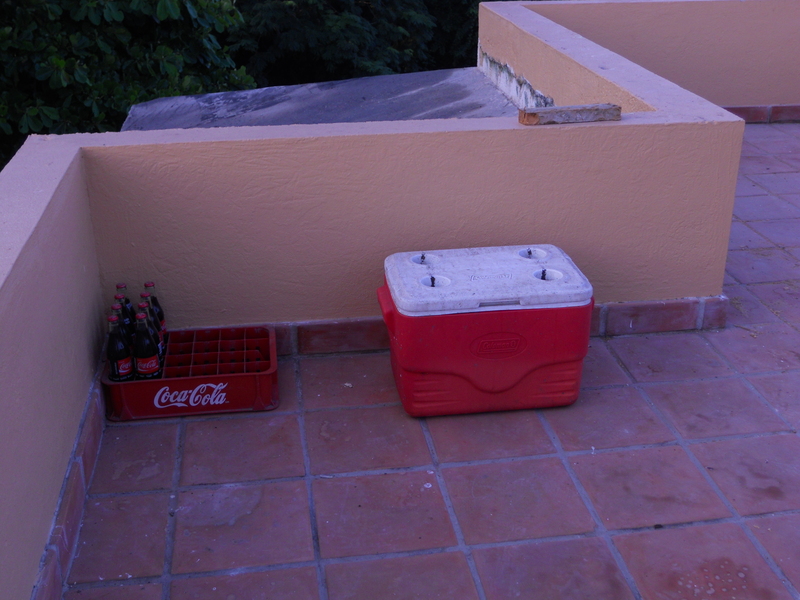 We retreated to a more quiet area around the corner that had a roof to enjoy our food in peace. the Musee Mecanique on the wharf (really cool), the buskers and really interesting public bathrooms in the middle of the street. The bathrooms sanitize themselves after every visitor. It was hot, sunny and truly a beautiful day. We walked throughout the area looking at the shops, the seals and taking pictures. It was great. As the day wound down we worked our way back to the car and headed off to find the hotel. 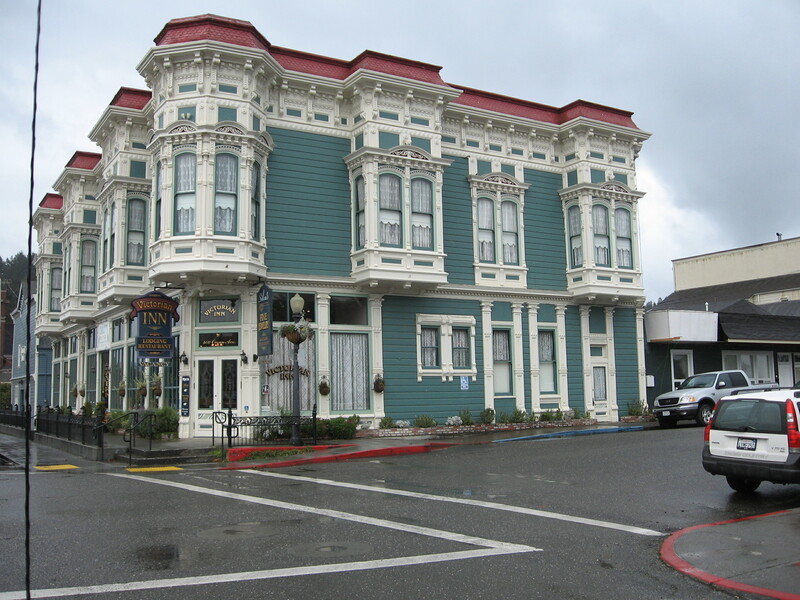 The Best Western Carriage Inn is located in the center of town a couple of blocks off Market Street. It was in our price range and had recently been renovated. We were looking forward to kicking back for a bit and resting our legs before dinner. We checked in and did the usual trek to the room with all of our worldly belongings. As we walked to the door we saw there was a sign on the door. The room had a name, The Pink Man room. Ok, that is a little odd but through the door we went. 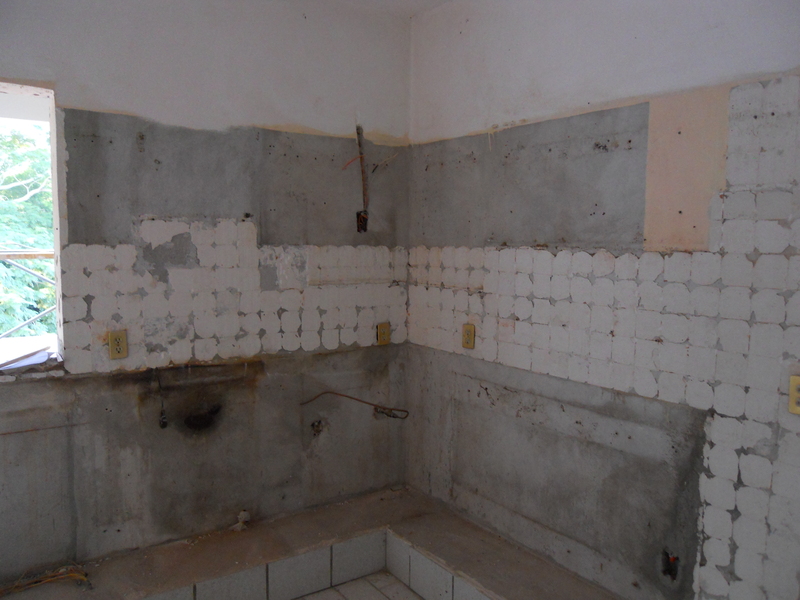 To say they had done a renovation is one thing but they did not tell you what kind of renovation they had done. It was a throw back to the art deco period but updated. 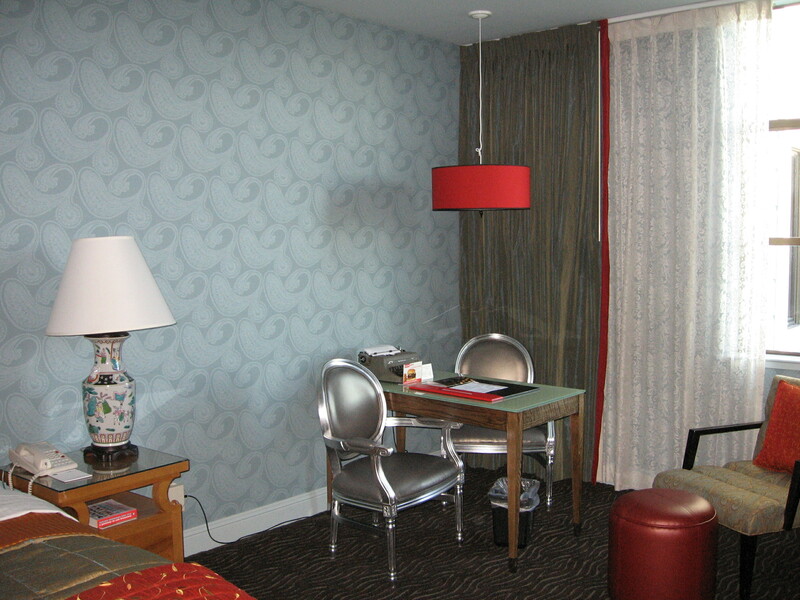 The room was spectacular, not your usual run of the mill hotel room. 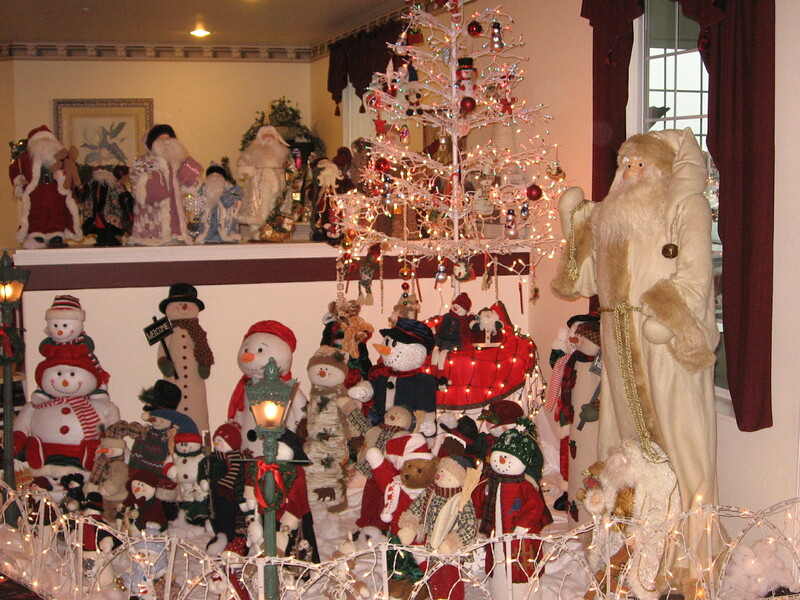 The decorations would be eclectic but fitting with what they were trying to do. On the table there was an old Royal typewriter exactly like the one I had typed my term papers on in High School with a piece of paper in it. On the piece of paper was the story of the Pink Man. It turns out they had named the rooms based on San Francisco legends. I have stayed in some nice hotels in nice spots in my time but this one was located in an older part of town is one that I will remember forever. It was neat, cool, groovy or sweet depending on your generation and I would stay there again. My oldest brother had once told me that San Francisco was the coldest place on earth. Well after the first day in town we would not agree with him, it was spectacular. So the next morning we dressed for the same. We walked out of the hotel and were outside for 30 seconds before we did an about-face and headed back up to the room for jeans, sweaters and jackets. It was bone chilling cold. No sun, lots of clouds. Ok so maybe he was right. We bought a day pass for the transit system and left the car in the parking lot as everything was easily accessible by transit and we could get off and on as we pleased. Today we did the areas we did not see the day before. 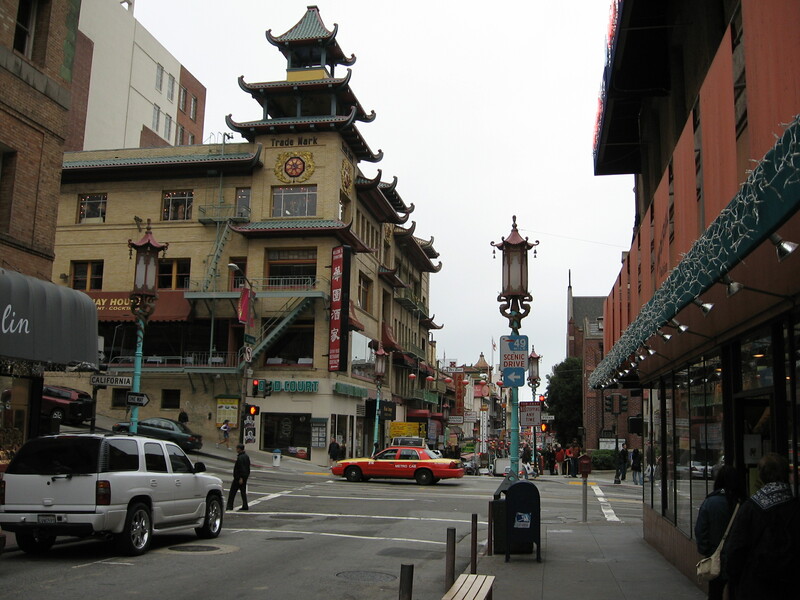 Chinatown, Ghiradelli square, Market Street. 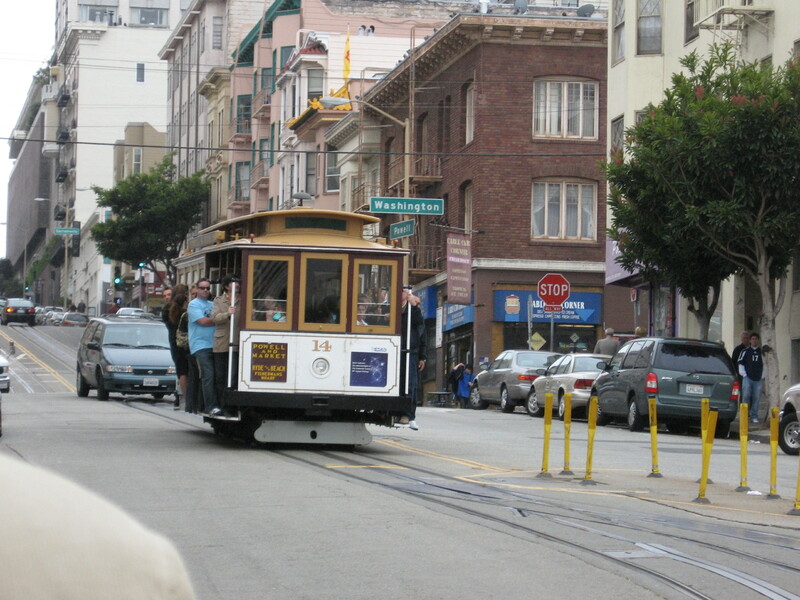 It was a full day with the highlight of the much-anticipated cable car ride up and down the hills of San Francisco! We boarded the car just off Market in a retail district with the idea to ride the route. And what a great idea it was until the car came to cable crossing where the driver has to release the grip on the cable to get over the cable going the other way and then he has to grab the cable again. He has to hit the intersection with the right amount of speed to get to where he can grab the cable to continue up the hill approaching. Well, our driver didn’t make it. He could not grip the cable. So here we were at the bottom of the hill going nowhere fast. The driver tried a few more times to get the cable but it was not going to happen. At that point a transit truck was going by and they stopped to see what was happening and what they could do. They were driving a Freightliner. They backed up the truck and took a run at the car (all while it was still fully loaded with passengers) and tried to push it up to where he could get the cable. He's going to do what??? No go, one more try. Still nothing. It was at that point they asked us to get off as the truck was going to have to push it up the hill and we could get on the next one. Well, we were a block from Chinatown and we were hungry so we decided to catch a much later one! In Chinatown it started to drizzle so we bought an umbrella and toured the shops, the alleys, and stopped for the most important meal in Chinatown, Dim Sum. It was lovely, not quite the same as you find in Edmonton but still excellent. From Chinatown we caught another cable car to finish the route we had started earlier. 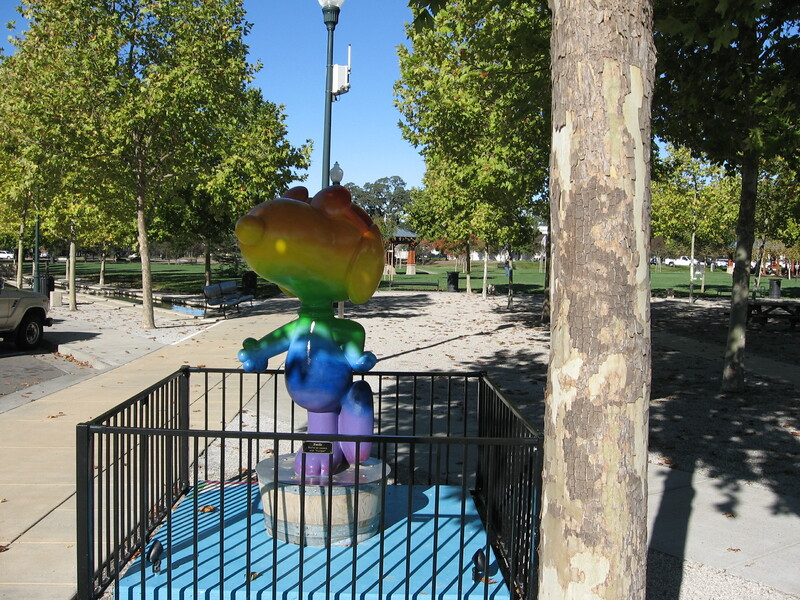 It dropped us down by Ghiradelli Square which while interesting was more shops though it did have a very interesting art gallery with some works by Tony Curtis. We spent at least an hour in there talking to one of the sales reps and examining their works of art. It was a very enjoyable visit. 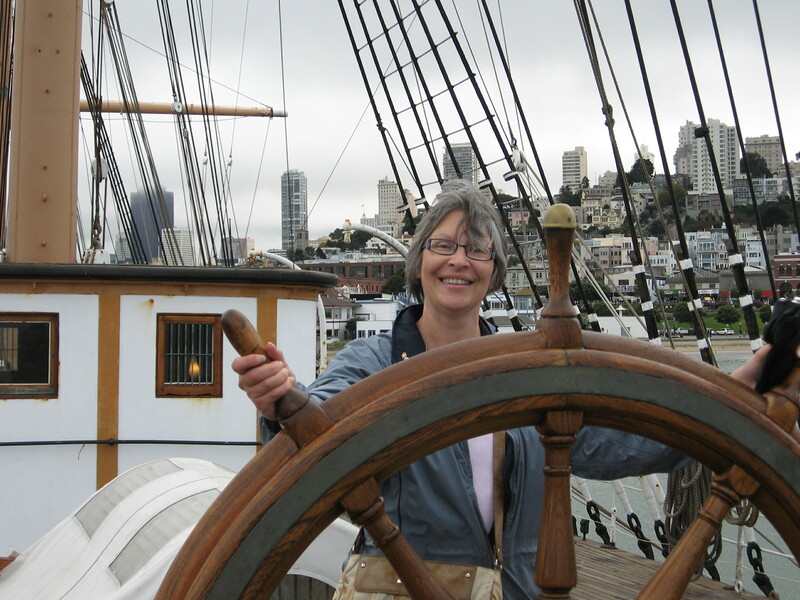 We walked along the waterfront, there is just something about a waterfront to people from landlocked Alberta, and found the San Francisco Maritime Museum on Hyde Street Pier. 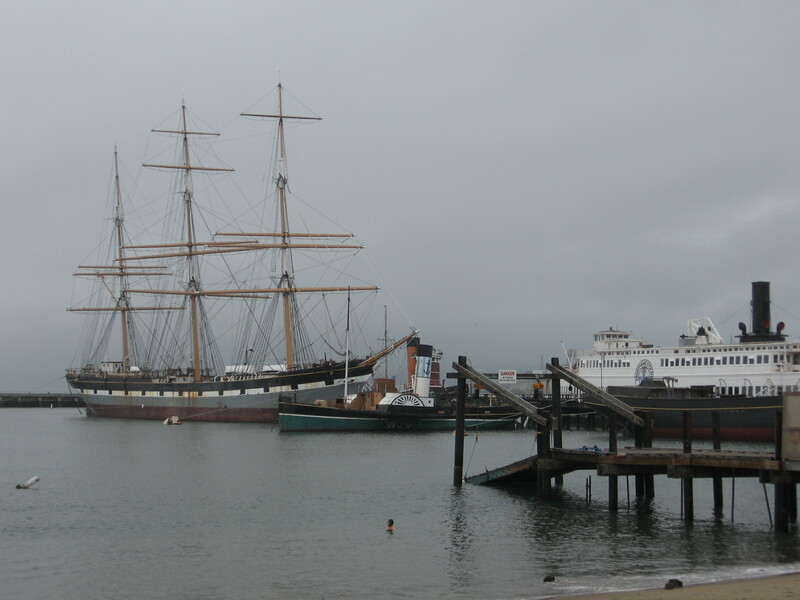 They have restored many old sailing vessels that are accessible for touring. It is quite fascinating. It was cold but we still had fun! It had been quite a day, we hopped another cable car headed back to Chinatown for some quick take out and back to the hotel as we had a long drive down the Pacific Coast Highway in the morning to get to LA. Author Kevin WoodPosted on November 7, 2010 Categories Starting new lifeTags Best Western, Best Western Carriage Inn, Eric Ross, Fisherman's Wharf San Francisco, Golden Gate Bridge, San Francisco, San Francisco Bay Area, United States1 Comment on The Journey to Casa Madera – San Francisco! Leave my plant toy alone! 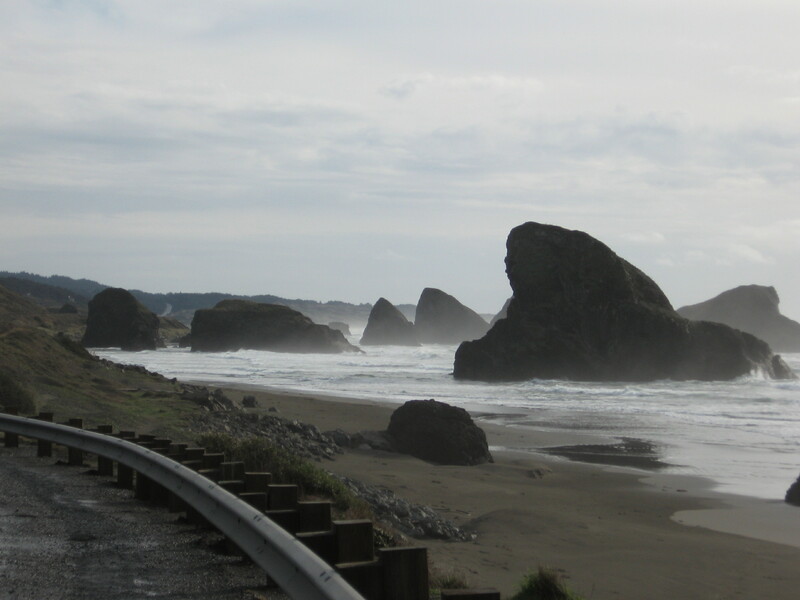 On November 4, 2008 we were on the road heading for Crescent City, California. It had been raining it seemed since we left Tsawwassen, British Columbia on October 31st, it hadn’t of course as we did see a little sun here and there in Seattle but for the most part it was either drizzle or pouring. Today was no different. Raining when we left Newport, Oregon but by the time we got to Bandon, Oregon the sun had come out and the weather started to warm where we actually took off a sweatshirt! 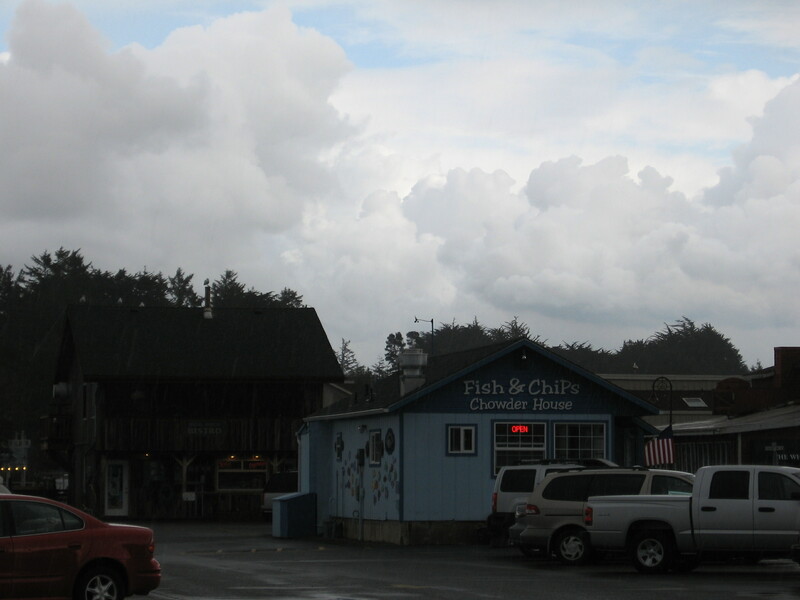 Stopped for lunch at a shack in Bandon which was simply called “Fish & Chips Restaurant”. Obviously that was their specialty so that was what we had. They had one table and 5 counter seats. The food was delightful and the place was very, very busy. Nothing like a good feed of fried battered fish to get you heart started for the rest of the days drive! Great food from such a small little shack! Arrived in Crescent City late afternoon and spent the night at the Lighthouse Inn. A quaint little motor inn that had already set up their Christmas display in the lobby. Apparently the businesses in town use their lobby for pictures with Santa. Halloween was just 4 days before! Hit the road on the 5th at 8:00 am and in my best Gomer Pyle imitation, surprise, surprise, surprise…it was pouring. 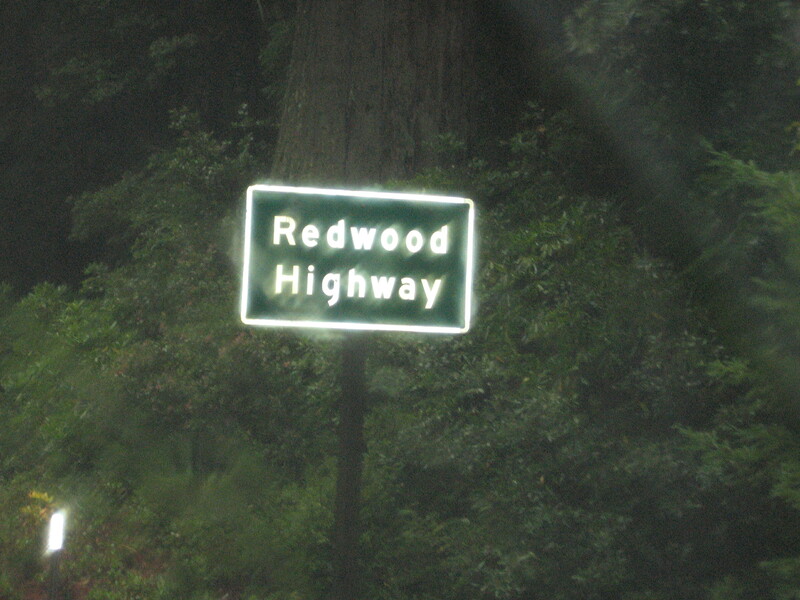 We were heading down the Del Norte Coast looking forward to seeing the Redwood Forest, hoping the weather would lighten up so we could actually see a tree when we got there! 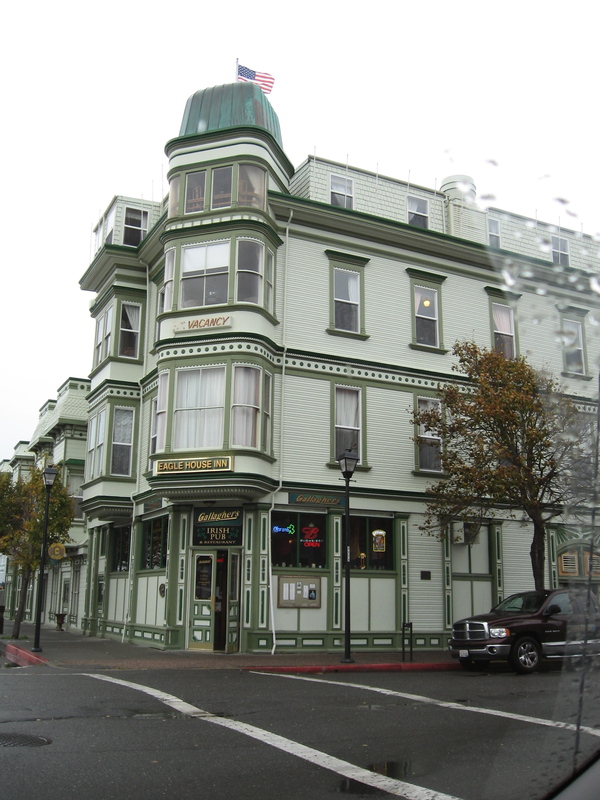 We arrived in Eureka, California and were shrouded in rain, wind and cold. We didn’t see anything there that necessitated us getting out of the truck for in that weather so we continued on. 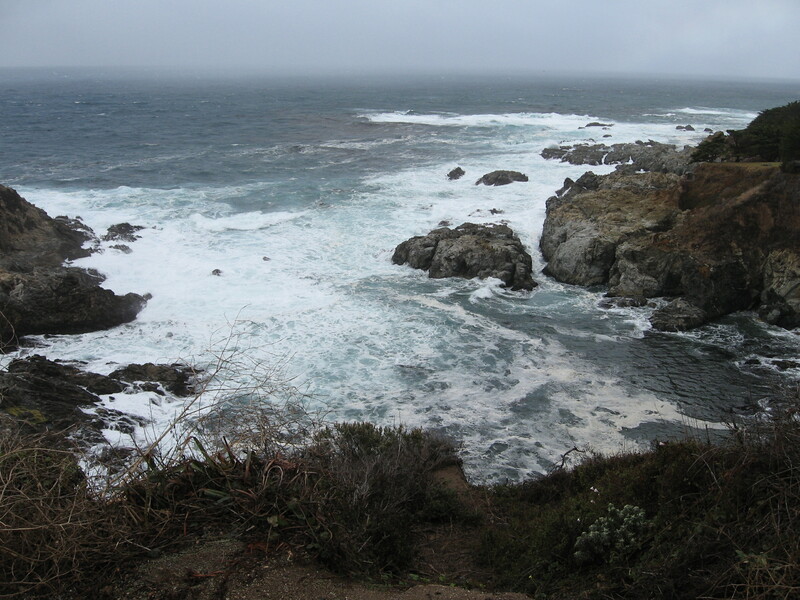 (I am sure there are many things to see in Eureka but the weather was awful so we kept going). 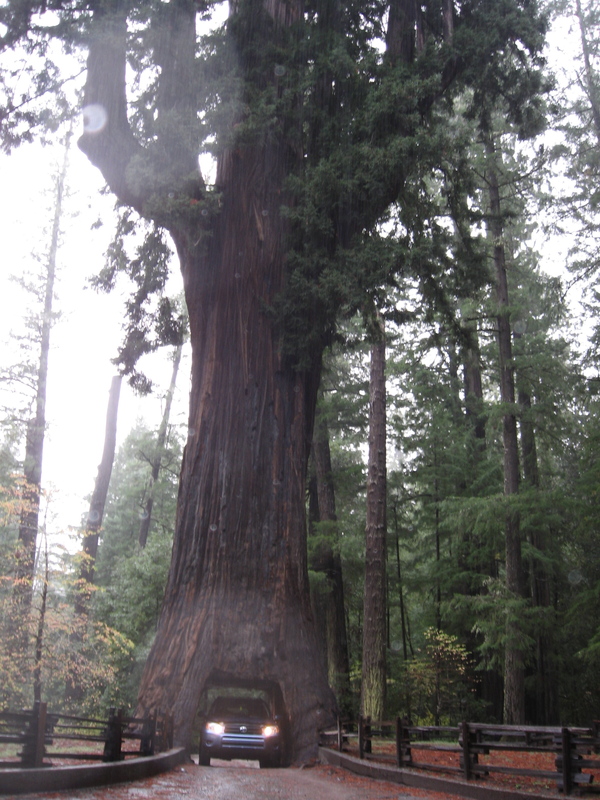 There had been a Ranger Station near Big Tree, California that we stopped at for a highlight map of the North Coast and in it we found a reference to Ferndale, California that made it sound interesting so we decided we would go there and see what we could find for lunch. The town is spectacular. They have done the town in a Victorian style and the buildings are gorgeous. Victoria Inn, Ferndale. Next time we may stay here. It was about 10 miles off the main highway but it was worth the drive. Not to mention it actually stopped raining while we were there! I would highly recommend stopping and having a look if you are in the area. Saw our first palm tree in Ferndale….ahhhhh. Well we paid our 5 bucks, we had to drive through the tree! near Standish-Hickory State Park. There we saw a sign to say how far we had come and how we yet had to travel! Oh and look, it’s pouring again. Well, at least it is not snow. 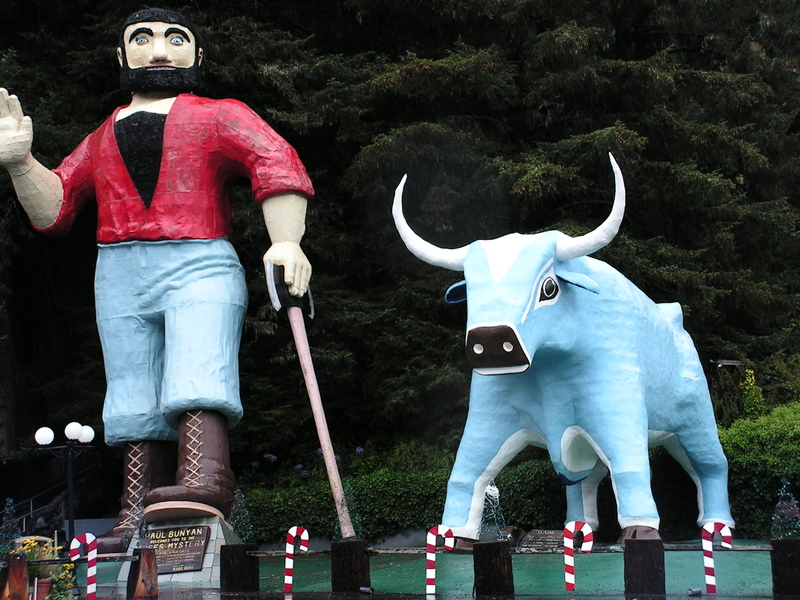 Not everyday you get to take a picture of a blue ox! 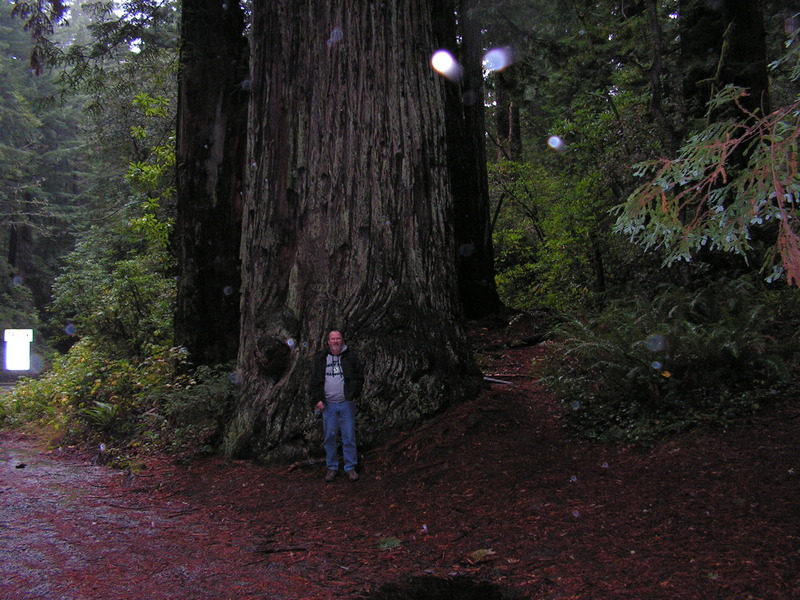 At 4:38 pm we were out of the Redwoods and heading for Ukiah, California to spend the night. It was then we spotted our first vineyard. Now we’re talking! 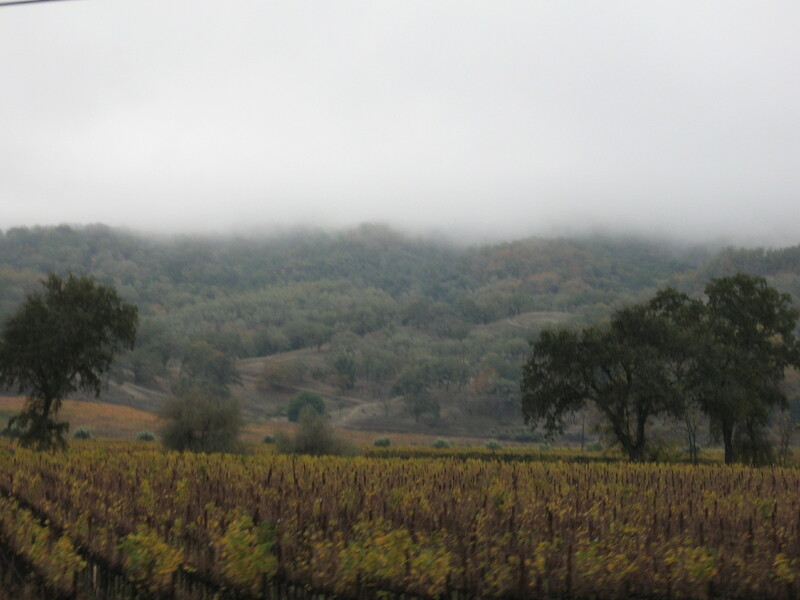 Clouds rising out of the first vineyard. 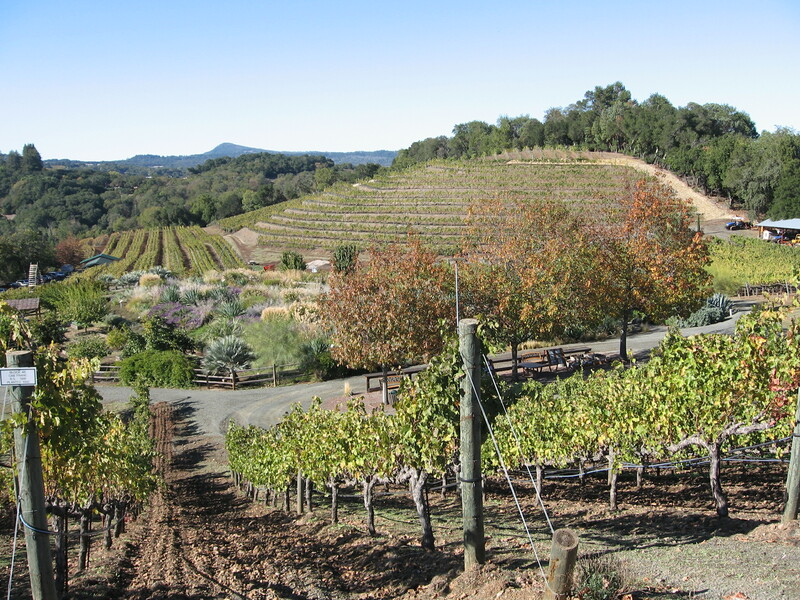 November 6th, the United States had just elected their first Afro-American President and we were going to tour vineyards while heading to Sonoma! It was a truly spectacular day, now if it would only quit raining. For the first 30 minutes on the road we were driving in clouds and drizzle but we crossed the Sonoma County Line and the clouds parted, the sky was blue and the sun was shining brightly. The first city we came across was Windsor, California. It was a beautiful town and suburb of Santa Rosa. We went looking for a map store as we needed a Mexico map for our GPS. We found the map store but no gps maps. We bought a paper one in case we were unable to find a software plug-in. This town was nice, they had Peanuts characters all over town as this was where Charles Schulz lived a good part of his life. One just has to take a picture of Snoopy! It was also time to change the oil in the car. So off we went to the local Chevron oil center. Oil freshly changed we were back on the road and heading for Benziger Vineyards. We managed to make it there in time for their 1:30 tour and off we went. A beautiful spot, they had worked hard to be a bio-dynamic vineyard to maintain their vines without chemicals. It was worth what we paid to take the tour. Oh that’s right it was free. The wines were nice but not within our budget so we moved on looking for another. 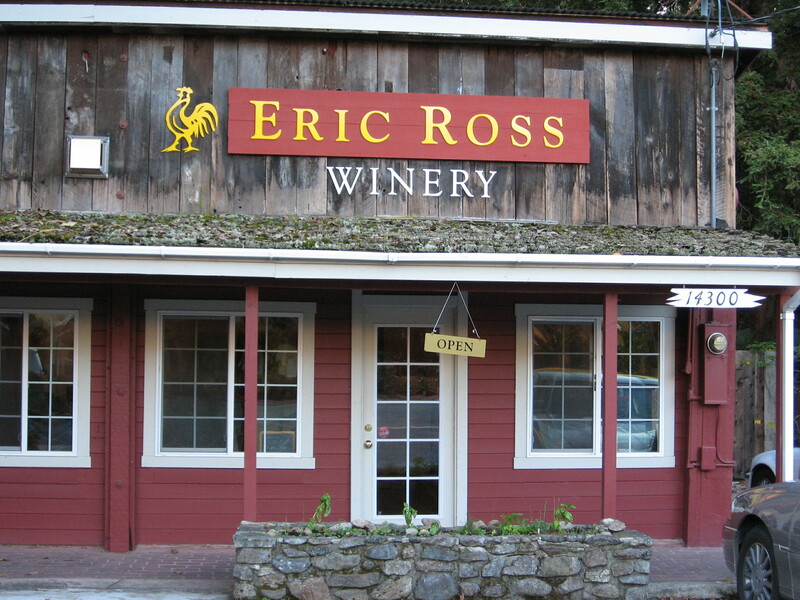 We ended up in the Eric Ross Wineries Tasting Room and a lovely time talking to the manager and trying a few wines. We were there for at least an hour and bought a few bottles to enjoy on our trip. We picked this one! It was a great choice! From there we ended up in Sonoma at the Best Western for the night. The center of town is very nice with a lovely square and lots of restaurants. The man from Eric Ross had told us about a great Italian place that was near the hotel and we did our best to find it but if it was there it was invisible. So instead we bought a pizza and enjoyed it in our room with an excellent newly purchased red. 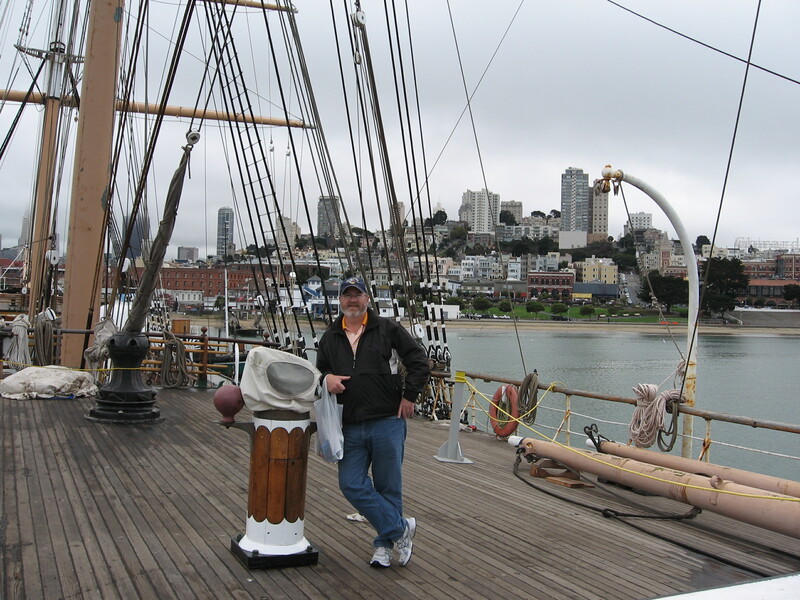 We would have liked to see more wineries but the wharf in San Francisco was calling!